In June 2017, it is again a rainy day in Saint Petersburg. Rainy days ARE rainy here, indeed. It is as if the clouds opened some “gates” to pour water onto the streets. Walking above the ground is an extremely wet experience then. Sightseeing UNDER the ground is an alternative. 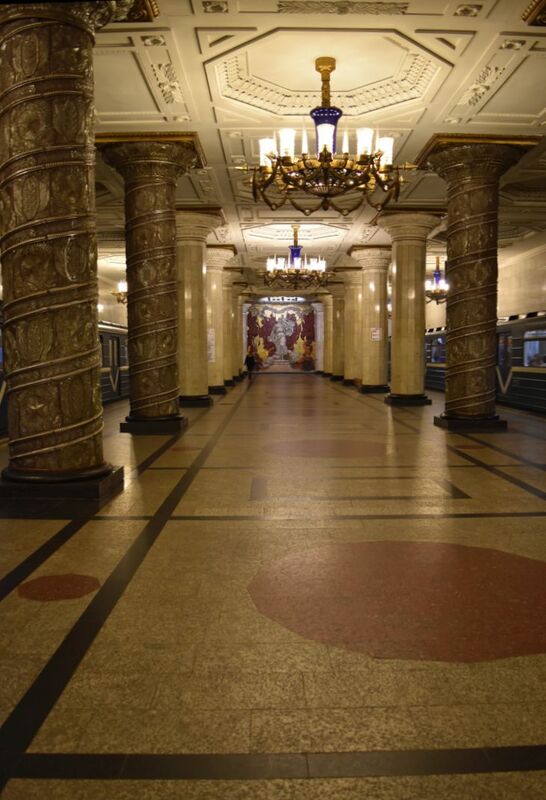 The metro of Saint Petersburg is great for that, above all the red metro line 1 inaugurated in 1955. 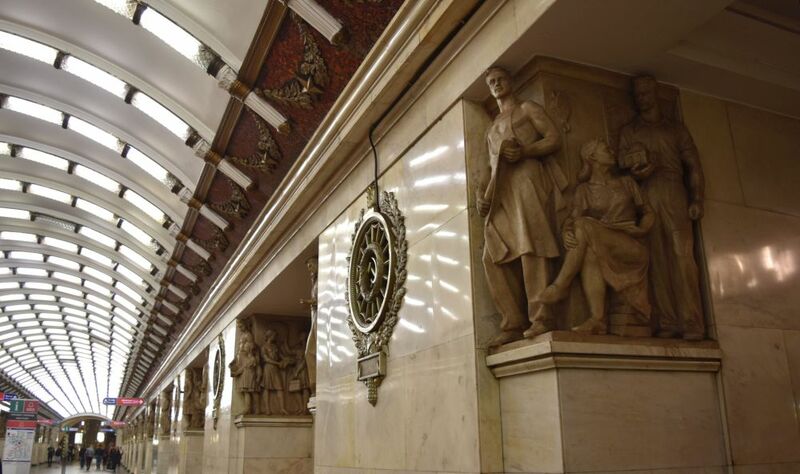 Here we are at Pushkinskaya – each station displays the route of the metroline. There are five lines and changing is possible at seven “multi-station” stops where stations are connected by tunnels – each station has its own name. 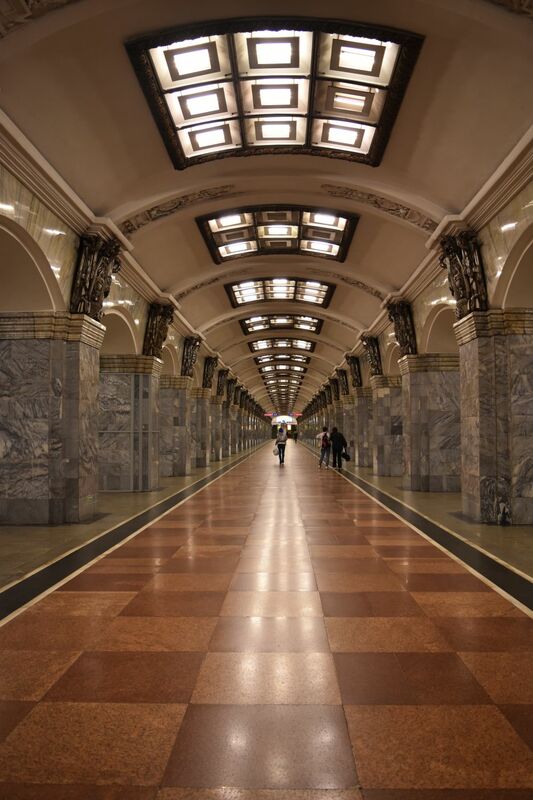 Six are double station metro stops, and under Sennaya Ploshchad there are three interconnected stations that are called Sennaya Ploshchad, Sadovaya and Spasskaya (metro lines M1, M2 and M5). It can take quite some time to walk under the ground to change between stations. The two anchors of Petersburg decorate the trains. We move from station to station on line number 1 to see the underground palaces built for the people. This is Baltiyskaya (Бальтийская). 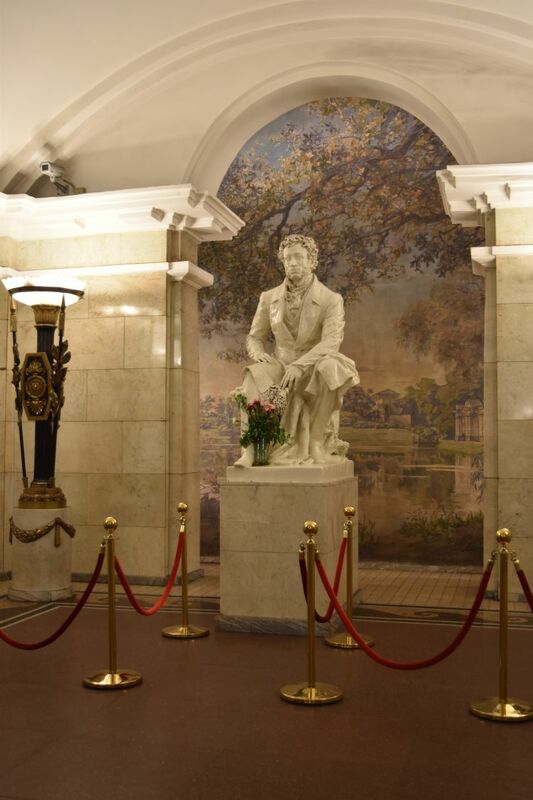 Pushkin, the great Russian poet, welcomes us at Puschkinskaya (Пушкинская). Narwskaya (Нарвская) with its heros of work is a socialistic experience reminding me of Ploshchad Revolutsii in Moscow. This is the station Kirovsky Savod (Кировский Завод). Kirov headed the communist party in Leningrad. He was murdered in 19434 – some blame Stalin for that, as he might have feared that Kirov became too powerful. 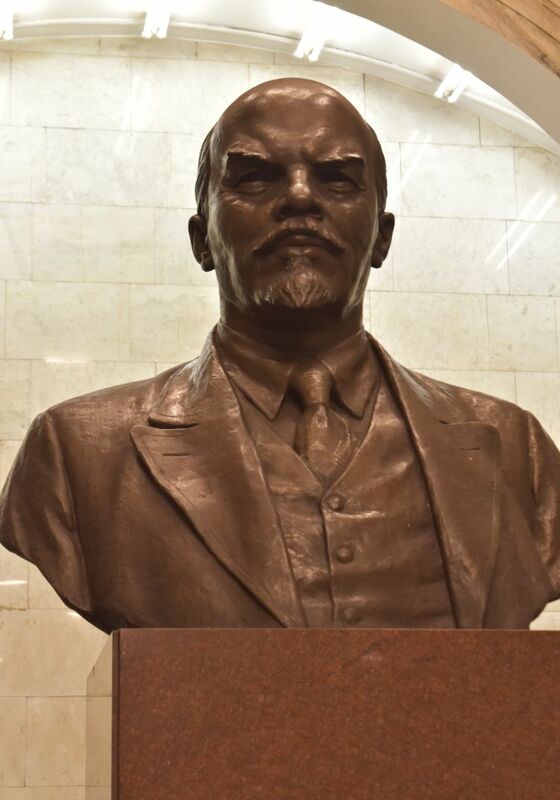 Lenin stands at the end of the Kirovskaya station. Avtovo (Автово) is our last station on metro line 1. The columns are very carefully designed…. … and some of them are covered using glass. 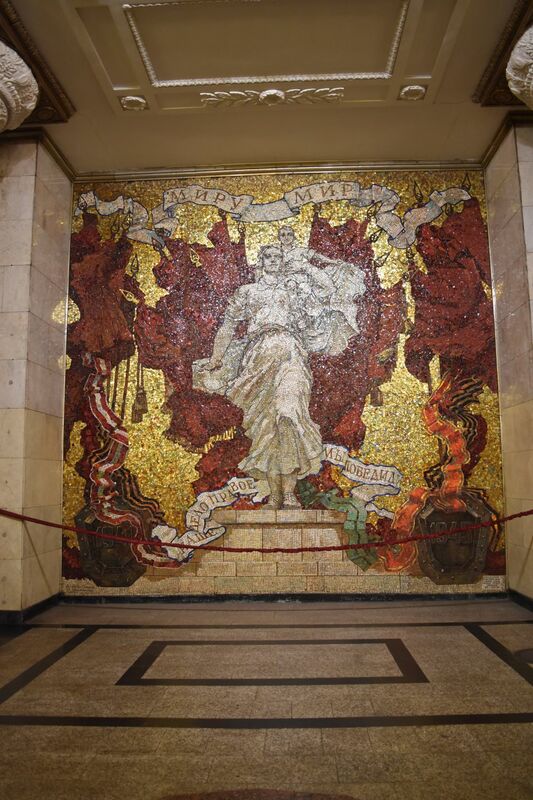 The mosaic here says “peace for the world”. In Russian this can be said very shortly: “миру мир” (literally “for the world (we wish) peace”), as “мир” (“mir”) means both “world” and “peace”. 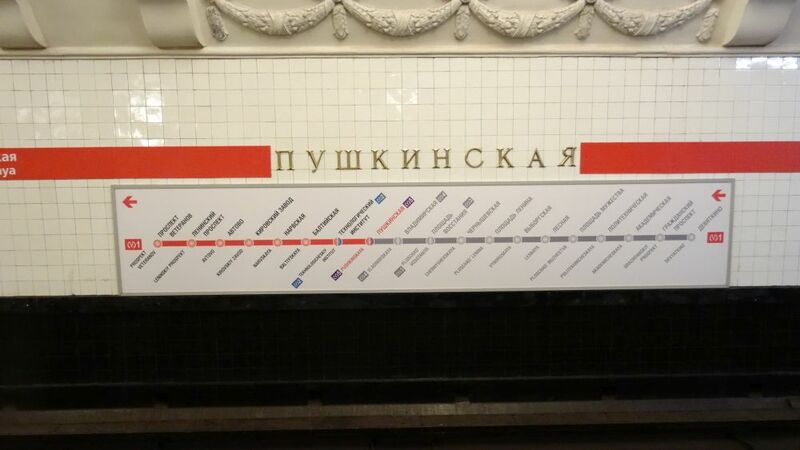 At Pushkinskaya we change to the connected station Svenigorodskaya (Звенигородская) to continue with the purple metro line 5. Here we find Peter the Great. At Admiralteyskaya (Адмиралтейская) we leave the metro. Neptun says good-bye to us. 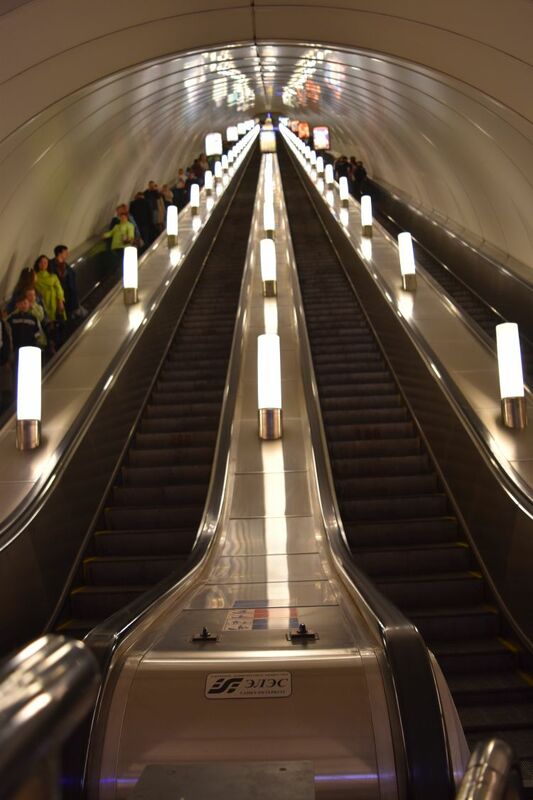 We tackle the long-long escalator of Admiralteyskaya. This station is 86 meters under the ground. 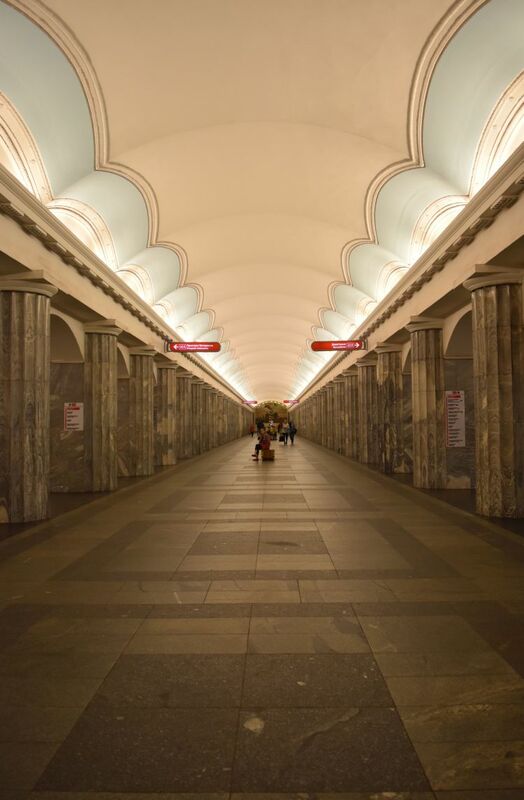 The metro of Sankt Petersburg had to be dug deep into the ground because of the swamps – and Admiralteyskaya is its deepest metro station. While riding on these long-long escalators I like to watch the people – reading a book, chatting, kissing, combing their hair, wiping on the smartphone, searching for something in their bags or simply dreaming. Few people rush, as the metro comes every three minutes anyway. The few who do so jump down along the escalators; sportive people running upwards are very rare. 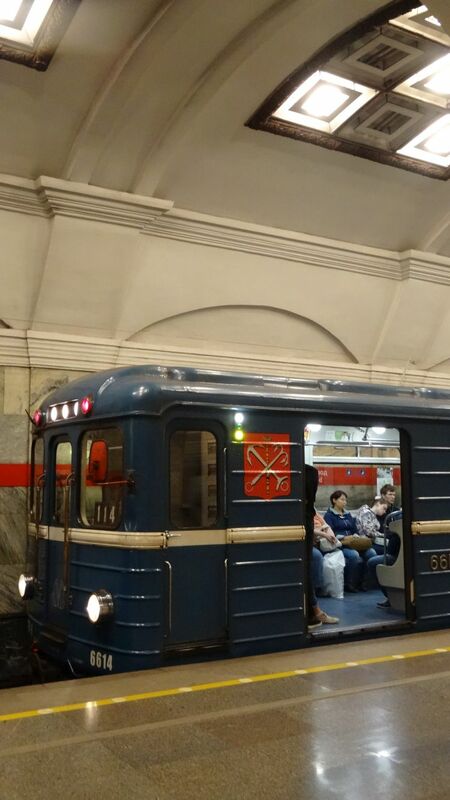 Yes, the metro in Saint Petersburg is not only very practical to move around in town, but it makes also a sightseeing object on its own right at the cost of one metro ticket, about 40 Rubles. 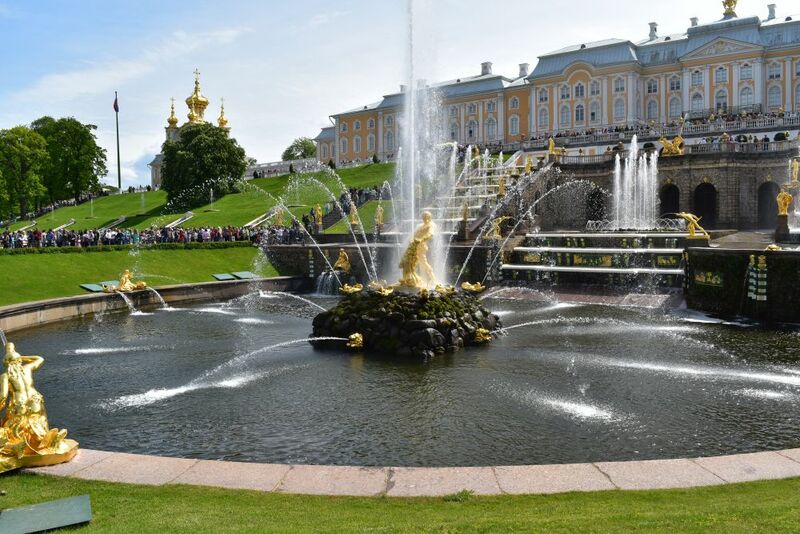 Peterhof near Saint Petersburg is my favorite park ever. I was there with Ernst – some fifteen years ago. I was here alone in the pouring rain – some four years ago. Now on a sunny Sunday in June 2017, I return with Ursula and I am happy to see that she enjoys Peterhof as well. 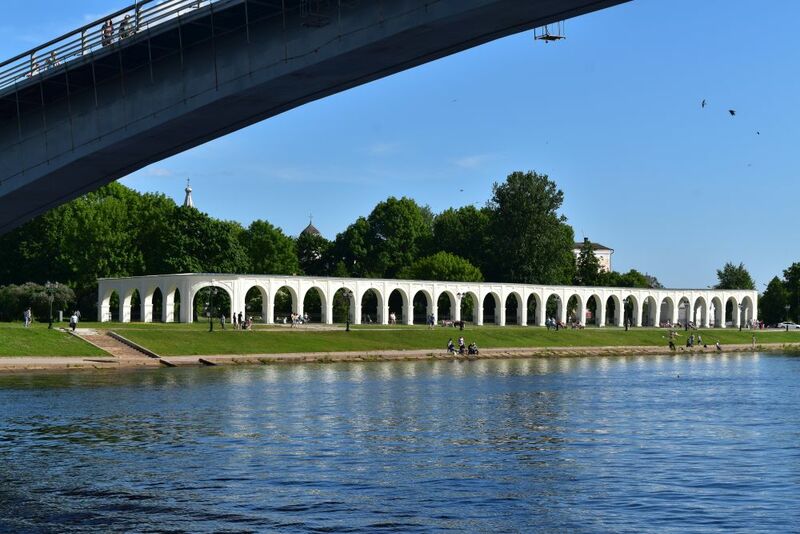 We take the hydrofoil or meteor at the Admiralty Embankment and chase along the Newa and the Baltic Sea. 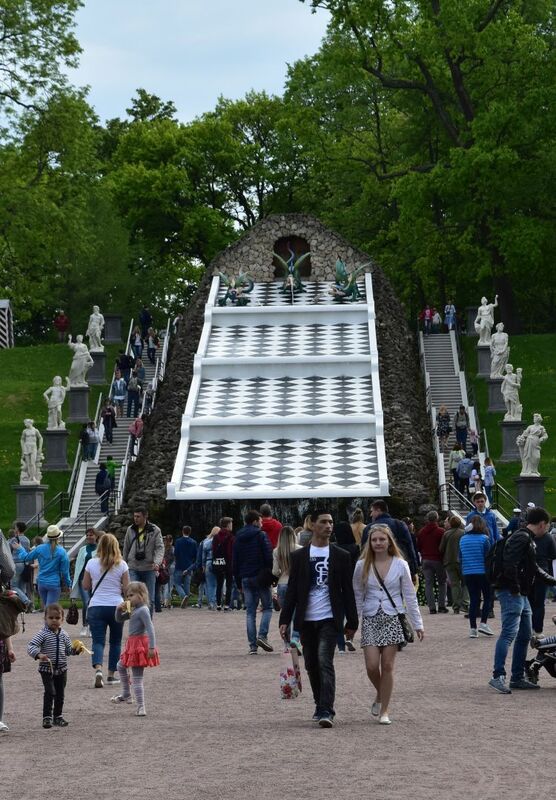 At the peer of Peterhof we buy entry tickets for the park. This is the view of the peer with the Gulf of Finland taken from the castle. The channel leads from the Sea to the castle. 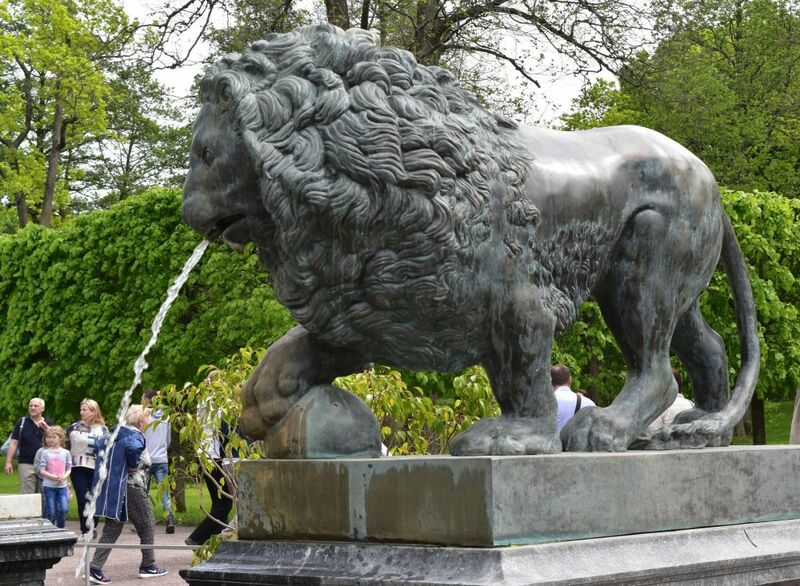 It must have made a great impression on visitors visiting Peter the Great at Peterhof. A clever demonstration of power that Peter the Great had conceived together with his German architect Braunstein. The castle has been designed by Rastrelli, one of Peter’s main baroque architects. The central cascade with the fountain of Samson reflects in the sun. And Rastrelli’s castle is a romantic silhouette behind the “water curtain”. 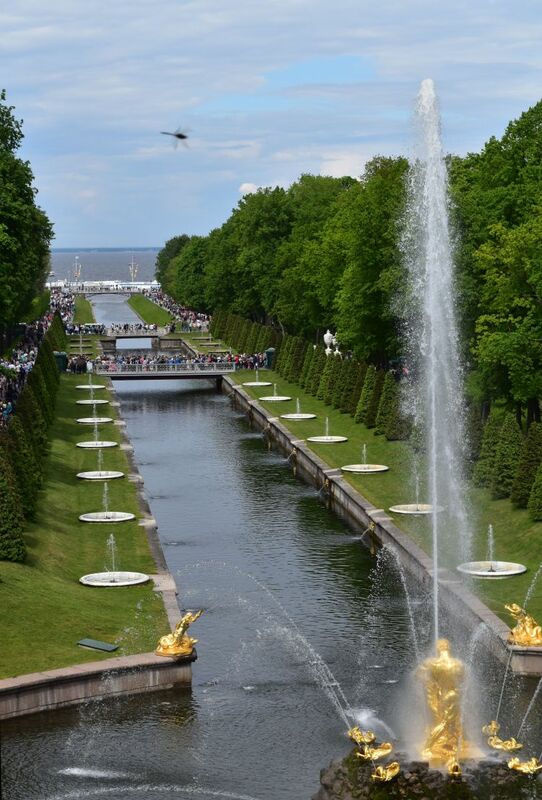 It is Sunday, and many, many, many more people from Saint Petersburg enjoy the park with us. We can feel, they do ENJOY the park. The atmosphere is relaxed. 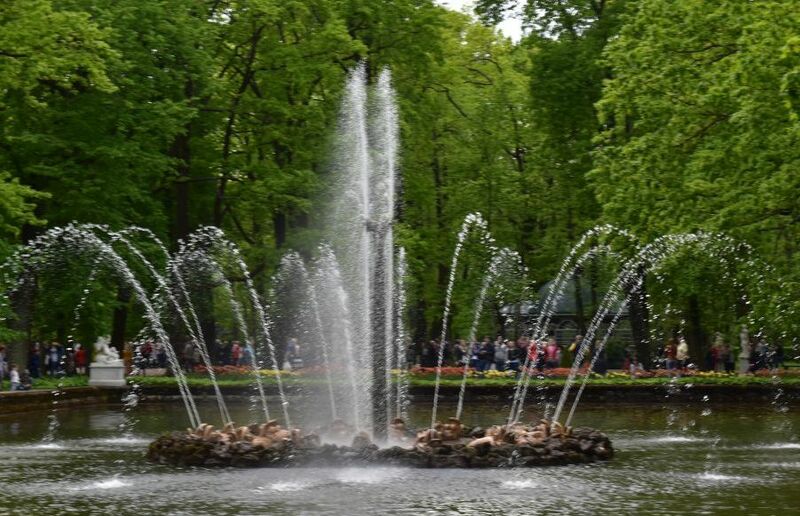 Actually, the large number of relaxed visitors adds to the charm of the park with its fountains. We first explore the fountains west of the castle. This is the Golden Mountain fountain and we believe the tree in the foreground is a quince tree. towards the east of the castle, Adam. I am not sure, what this fountain is called like. … and the Chestboard Fountain. There are also some nice Pavillons in the park. This pavillon is called “Marly”. It was a guesthouse that now has been renovated to show the furniture that Peter had selected for his guests. For instance the kitchen with the blue Dutch tiles and the sleeping room with millefleur wallpaper and matching curtains. The Marly can only be visited with a tour guide that goes into detail… we escaped silently in the middle of the tour. 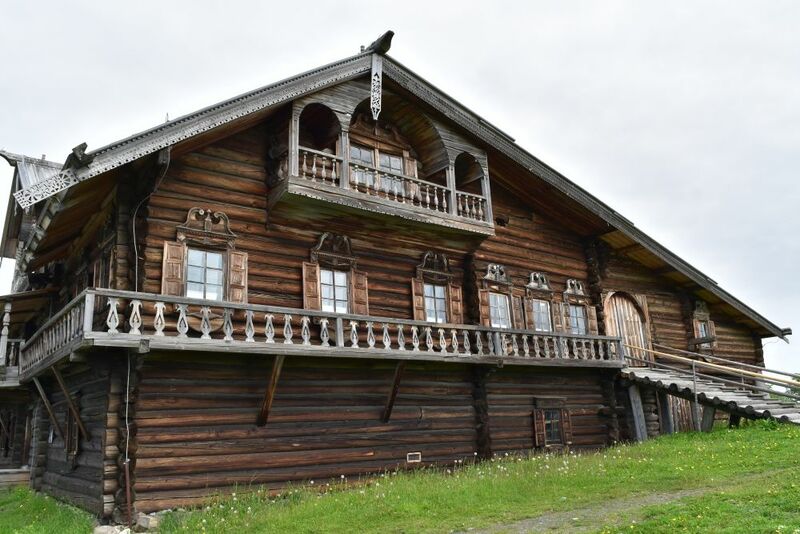 Peter the Great loved his Monplaisir house located on the shore of the Gulf of Finland. 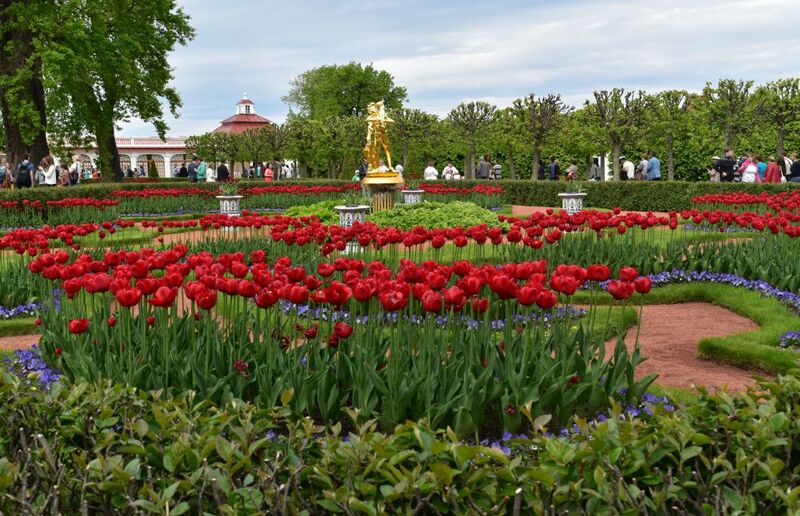 The garden leading to his Monplaisir shines red – the tulips are in full bloom, as in June it is still spring in Petersburg. Unfortunately we could not enter Rastrelli’s palace. When we tried to buy tickets more than an hour before closing time, the ticket office was already closed. 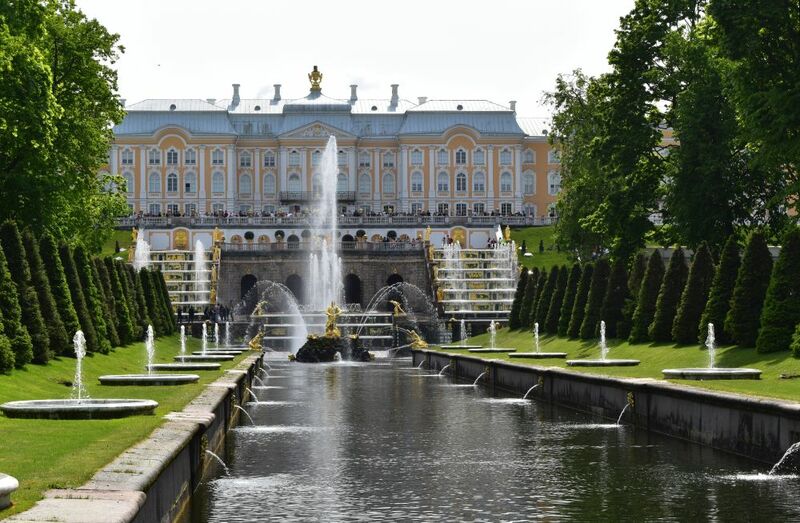 Well, we enjoyed the gardens and we look forward to seeing Rastrelli in Puschkin – he has also conceived the Palace of Catherine I. 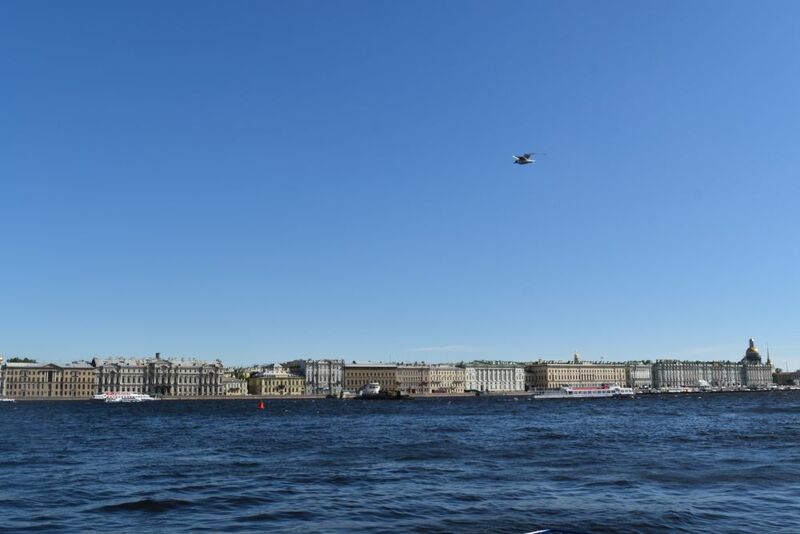 … and take the hydrofoil back to the Ermitage in Petersburg. 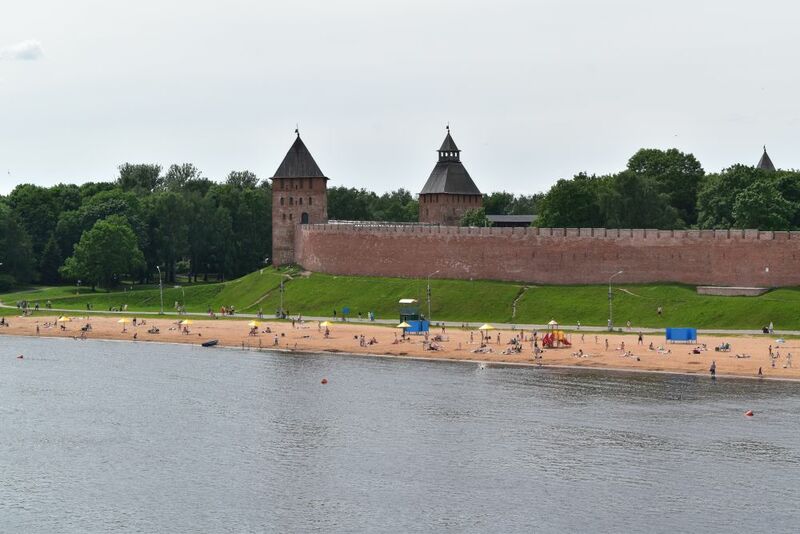 In June 2017, we spend a weekend in Novgorod. On Saturday, we saw the cathedral of Saint Sophia, the Intercession Church and the market place. 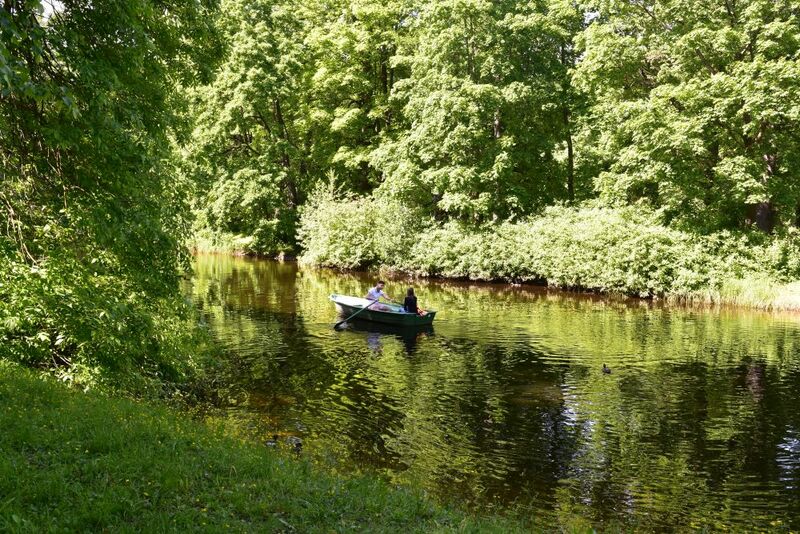 Then we relaxed going for a boat ride on the river Volkhov. 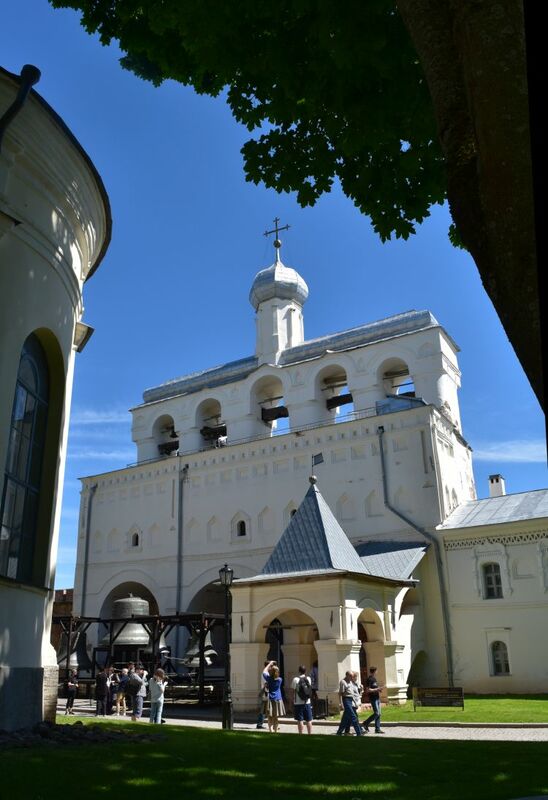 We slept well in our luxury hotel room and, on Sunday morning, we wake up to spend another sunny day in Novgorod. 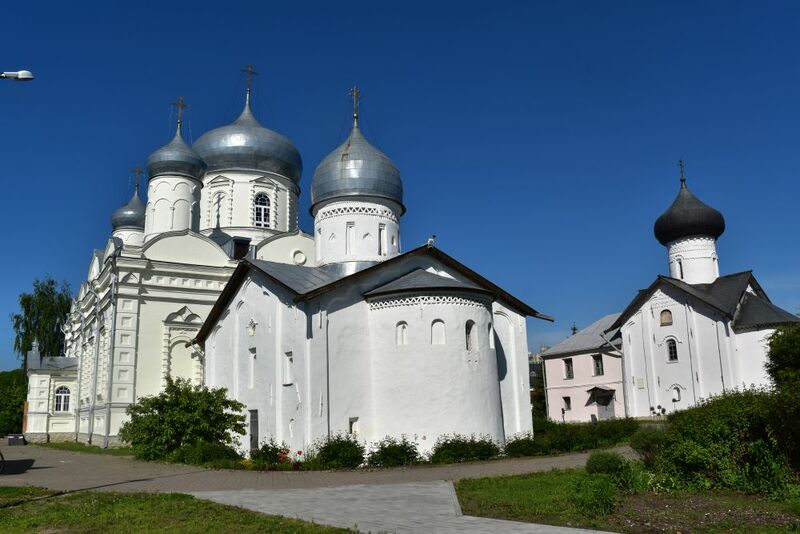 Before breakfast we visit some more churches north of the Kremlin of Novgorod. Our first church is the Peter and Paul Church in Kozhneviki (Церковь Петра и Павла в Кожневиках) from the 15th century. In the Sverinj Monastery we find the Church of Intercession or Покровская (Maria Schutzkirche). A service is going on inside and we attend it for a while. The white church to the right with the black dome is called Church of the White Saint Nicolas. In the monastery we find a monument for Patriarch Alex II. He was the first patriarch after the fall of the Soviet Union. He says: “Do not allow to sow the seed of hatred in your souls.” Beautiful. 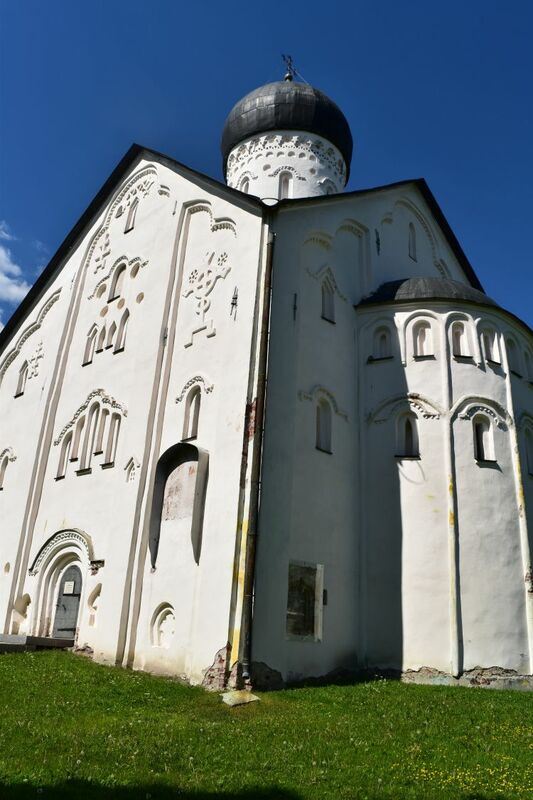 After breakfast we take the bus to the south of Novgorod to visit the Juriev monastery (Юрьев монастырь). It has been founded in the early 12th century (by Jaroslaw the Wise). 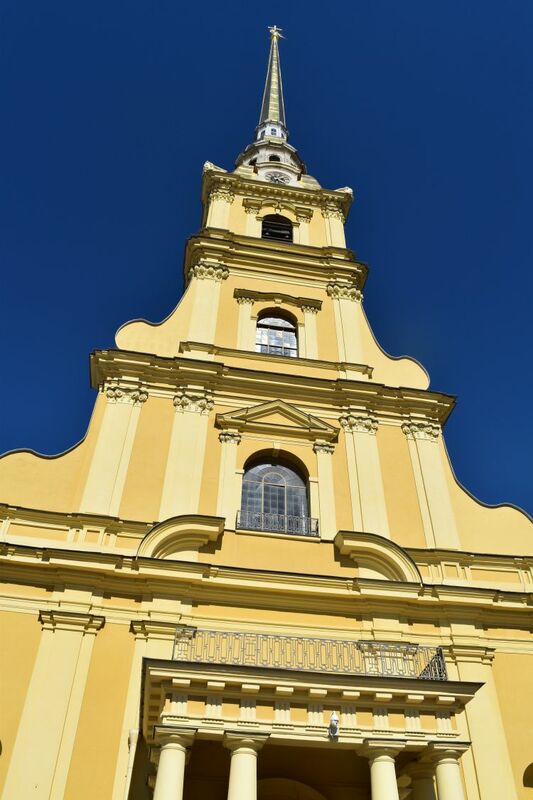 The eyecatcher is this Cross Exaltation Cathedral from the late 18th century with the blue roof and the golden stars. 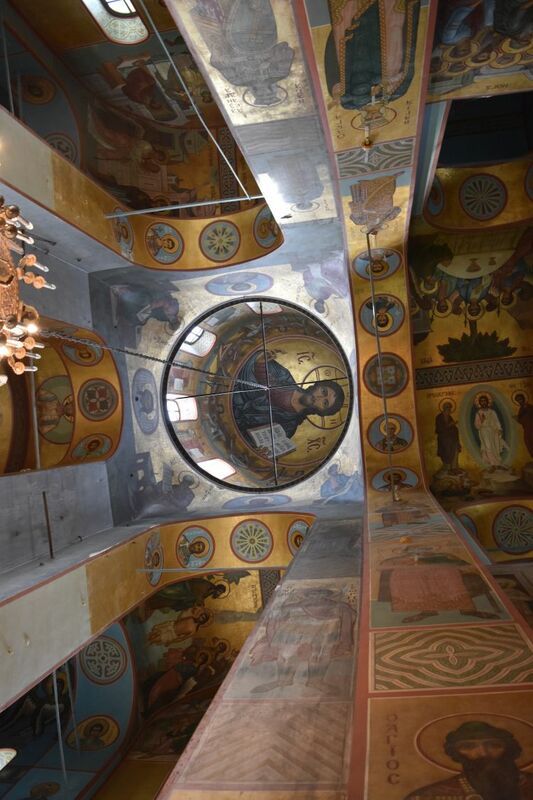 … with the (restored) Pantokrator in the main dome – high up in heaven. 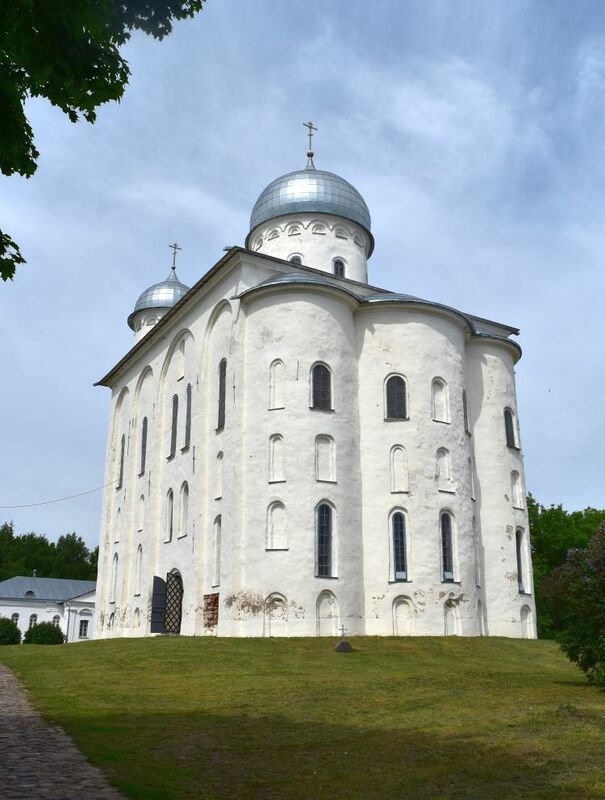 Our next destination is the Vitoslavlitsi museum (Витославлицы), some 500m away from the Juriev monastery. 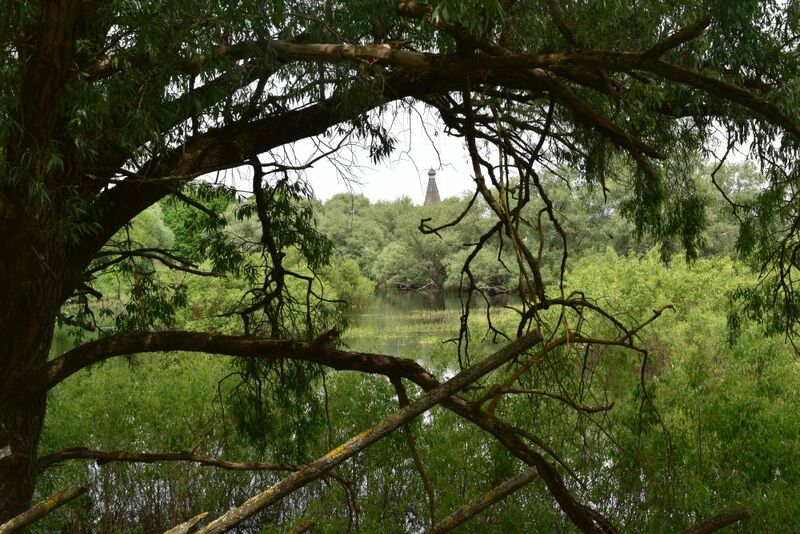 On the way we catch this view of a wooden church tower across the ponds. Inside the museum we find a collection of restored wooden churches and farmers’ houses. This is an example of a farm house with a traditionally dressed woman hurrying by. The State Novgorod Museum rounds off our two days in Novgorod. 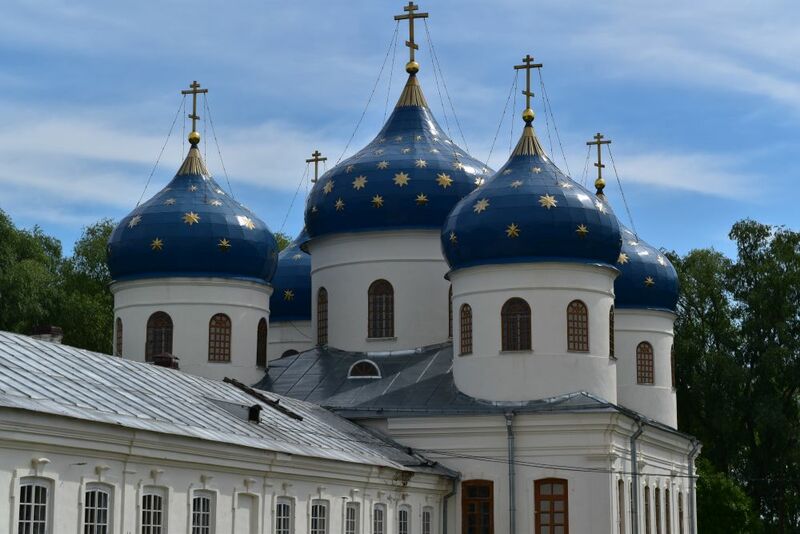 It has a large collection of artefacts related to the history of Novgorod. We are very impressed by the many manuscripts written on birch bark (берестяные грамоты) from the 11th to the 15th century. About 1000 such manuscripts have been found in and around Novgorod. Novgorod was a powerful republic until being conquered by Moscow in the end of the 15th century. It had its own school of icon painting and the museum has many of those icons on display. 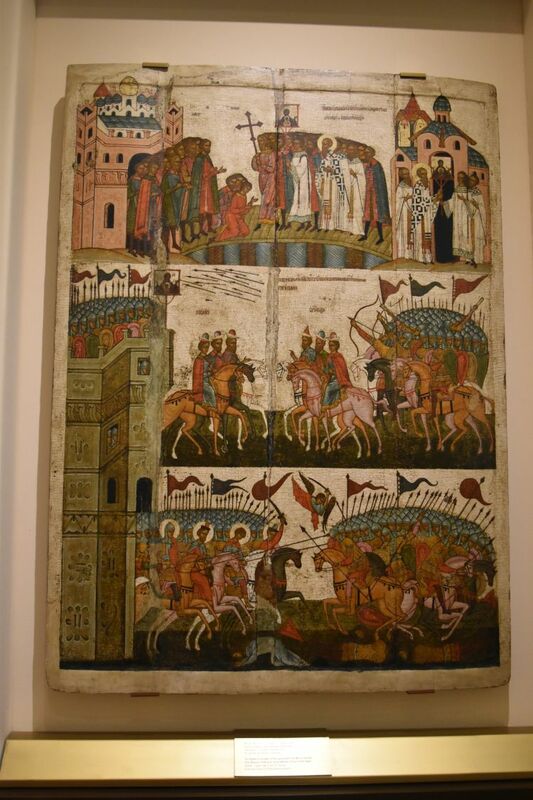 This is the defeat of the aggressors from Suzdal that started to flee, when the Novgorodians showed the icon of holy Mary (our Lady of the Sign) on their town wall (the miracle is reported to have happened in the 12th century). Ursula likes the archangel with the golden locks from around 1200. 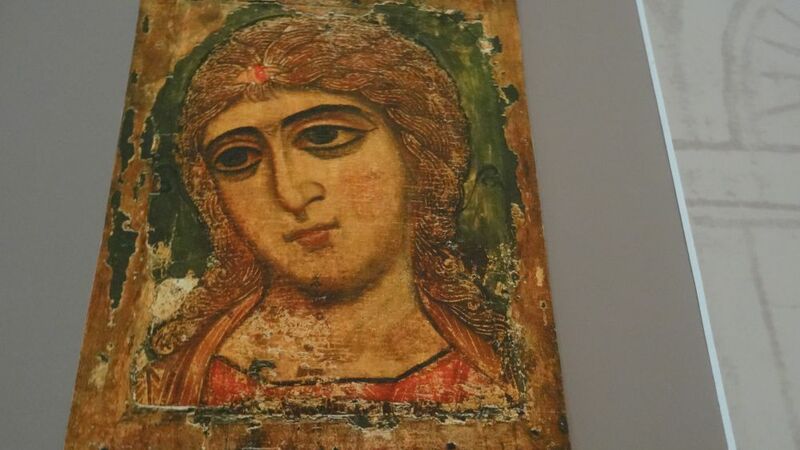 The icon is from Novgorod, but, if I understand correctly, this is a copy and the original is on display in the Russian Museum of Saint Petersburg. 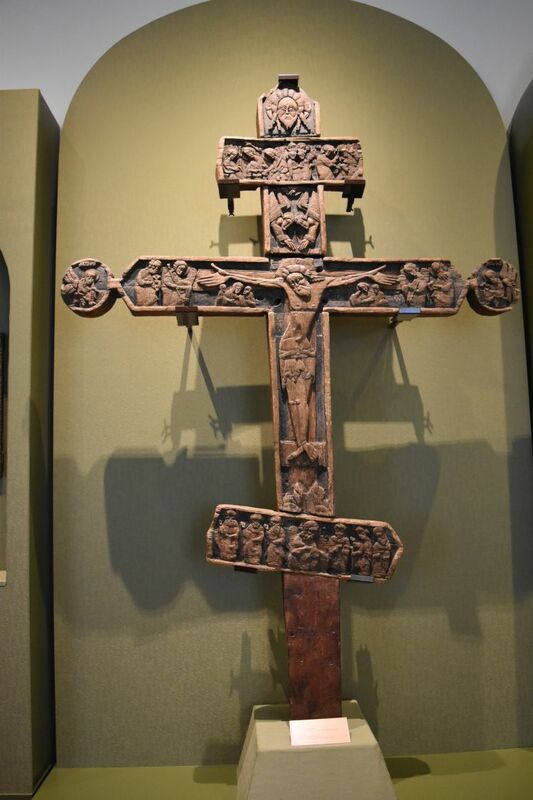 We finish off our museum tour in the room that displays artefacts carved in wood, like this beautiful orthodox cross. 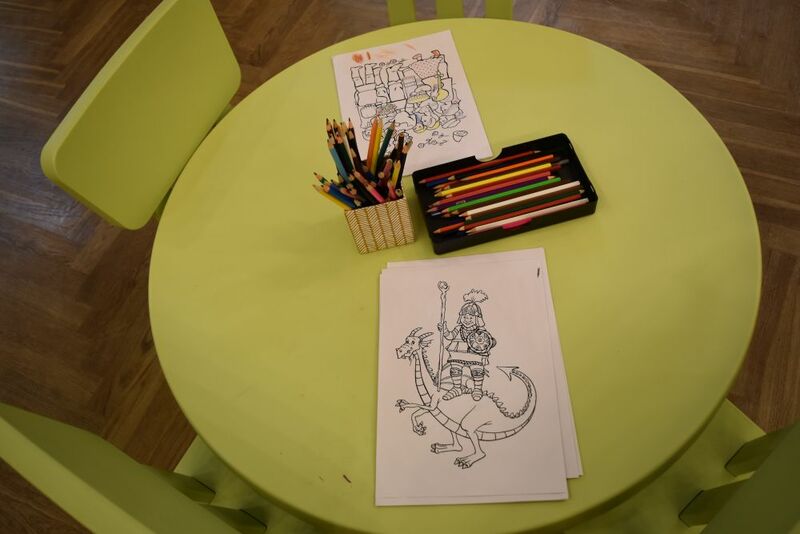 … and a table with material that make artists out of kids that are forced to wait for their parents. 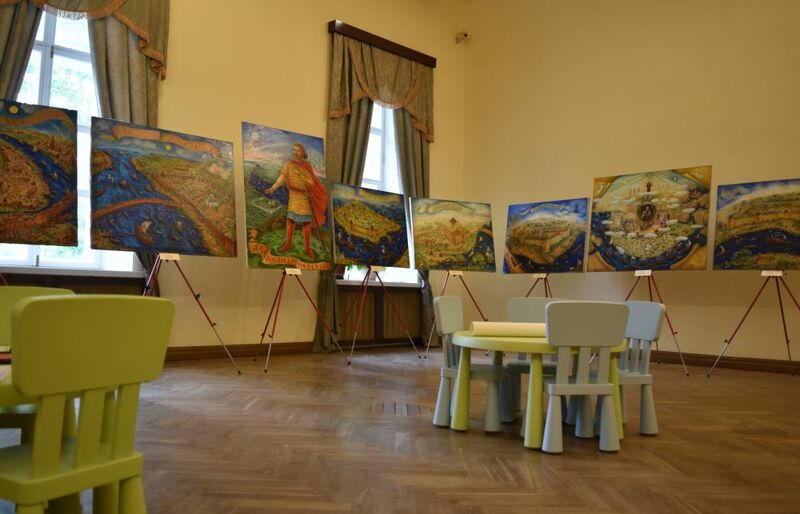 Perhaps one day the Novgorod State Museum will open up a room for the best artefacts created by kids. 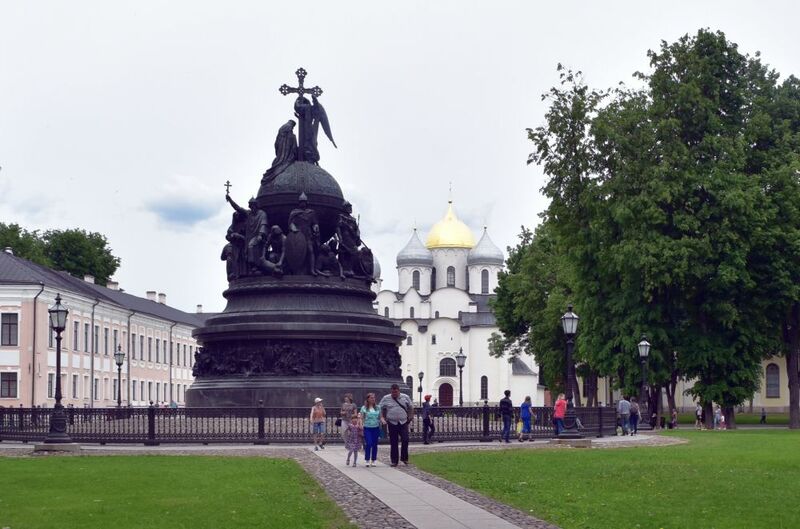 We look back to the Saint Sophia Cathedral and the monument that shows all the important men and women that by the middle of the 19th century had shaped Russia during 1000 years. At 18:05 precisely. our Elektritschka (suburban train) leaves for Saint Petersburg. We are amidst all the Russians that return from their datscha weekends. The sky covers with dark clouds and by the time we arrive in Saint Petersburg, it is pouring with rain. One of these Saint Petersburg rainfalls that make everyone wet-through within five minutes. We walk in the metro UNDER the Sennaja Ploschtschad, until we reach the metro exit that is closest to our apartment. Nevertheless, at home we have to hang up our trousers and jackets, while the umbrellas land directly in the bath tube. Fortunately I always wear waterproof Goretex shoes for sightseeing. 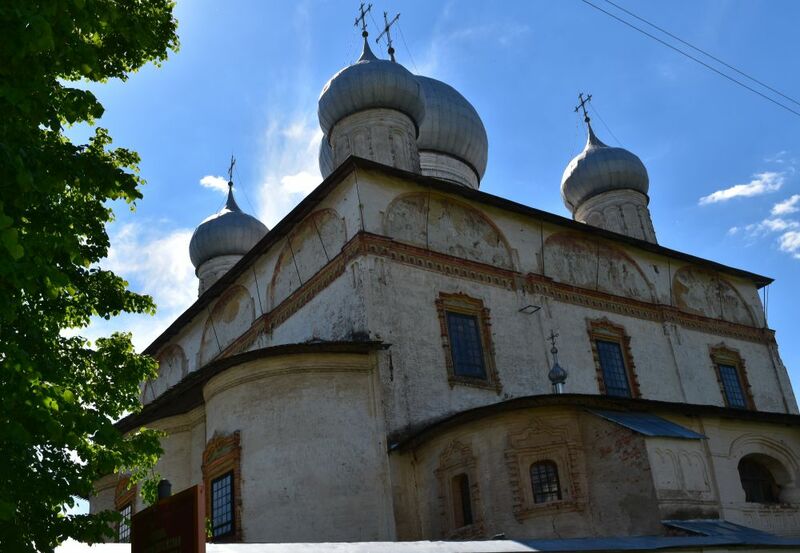 Novgorod was worth visiting and two days are not enough to see everything. Will I go back one day and also continue to Staraja Rossija, where Dostojewsky lived for a while? 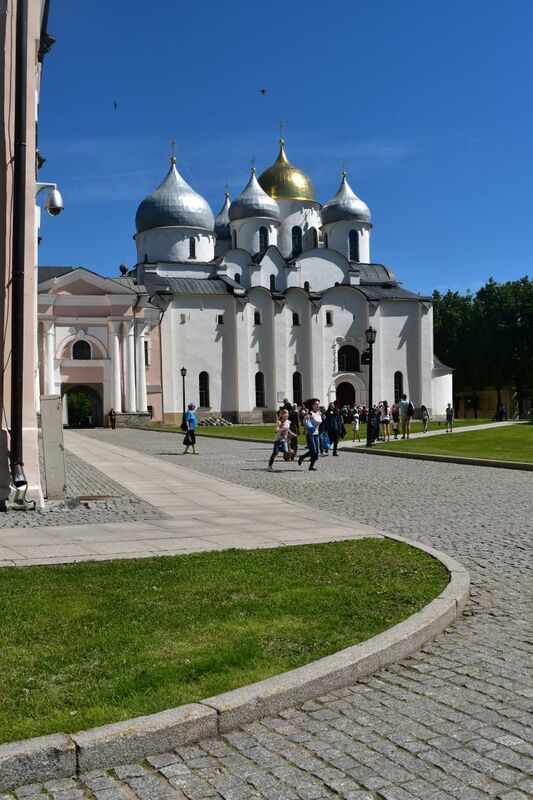 While spending almost four weeks in Saint Petersburg in June 2017, we made an excursion of two days to Veliky Novgorod (Великий Новгород). 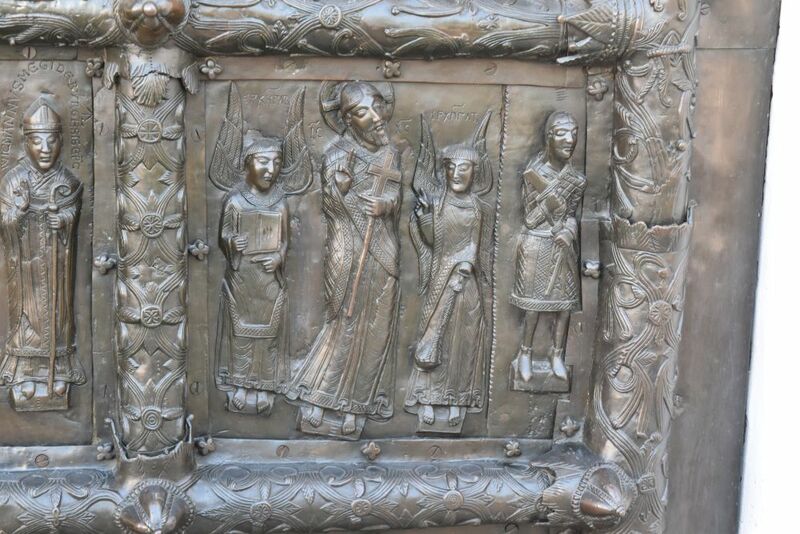 The main attraction is the Saint Sophia Cathedral with the Bronze Door from Magdeburg. 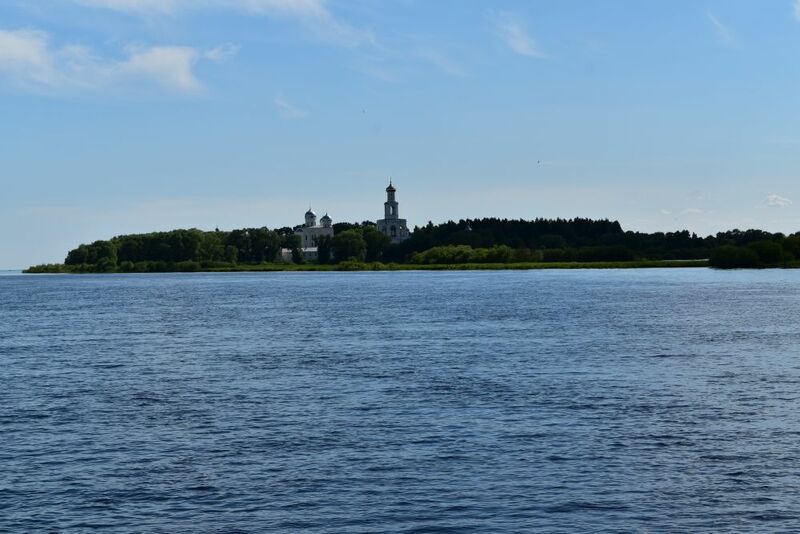 But then there is much more to see: the Kreml with the State Museum, about 50 more churches and the gorgeous setting of Novgorod on the river Volkhov and the Ilmen Lake. Novgorod is at about 190km south of Saint Petersburg. This counts still as a suburban connection and we can buy a “suburban” (пригородный) ticket at the Moscow station – easy and without having to stand in line. Our suburban train or elektritschka leaves Saturday morning at 7:25. About two hours later we are in Novgorod. 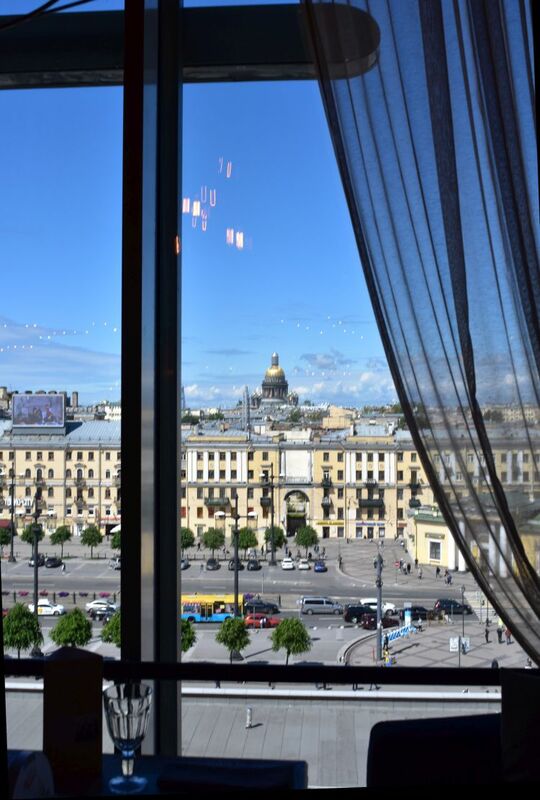 We have reserved a night in the Volkhov Hotel and receive a beautiful room on the fifth floor. 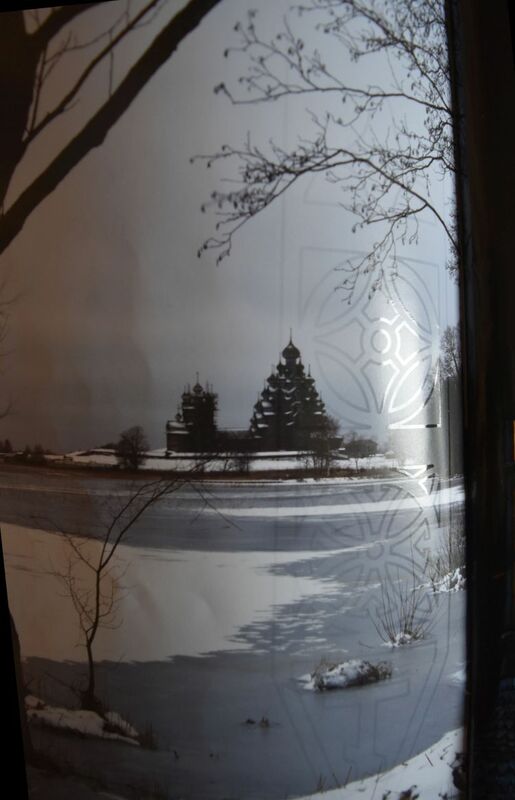 Ursula takes a great panorama foto of the Kreml wall (or Detinets). Our first destination is the Saint Sophia Cathedral from the 11th century. It is the oldest Russian Cathedral modelled after the Hagia Sofia in Byzantium. The Bronze Door is unique. 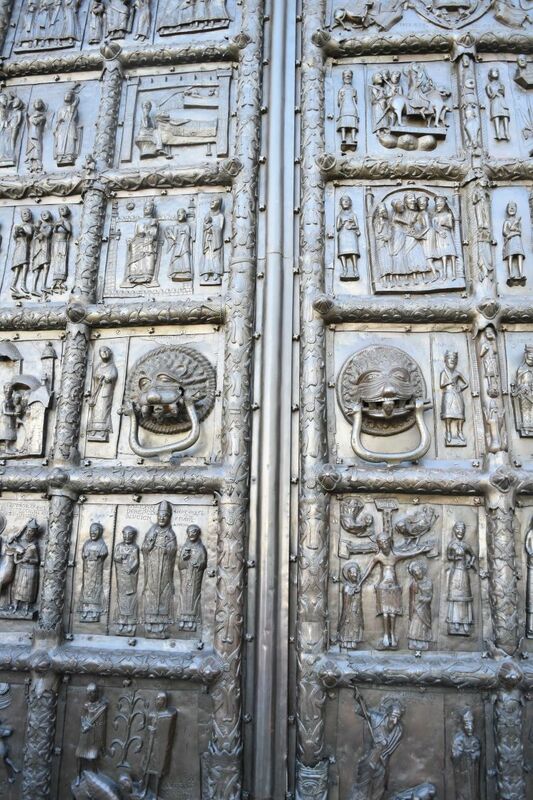 It was produced in Magdeburg in 1153 and it is unclear, how this door travelled from Magedburg to Novgorod – perhaps, because Novgorod was trading with the Hanseatic League. With my small guide “Die Bronzetür von Nowgorod” (Piper Bücherei 1963), we study the plates in detail. We particularly like the Ascension of Christ, as he is drifting upwards, away from this world. Inside we are proud to find Constantin and his mother – forbidden to take fotos in this holy place. Behind the Cathedral we take pictures of the belfry or bell tower. Across the river Volkhov, there is the former Tvorg (творг) or market place. Only the arcades are left as well as a few churches donated by merchants. One example is the Paraskeva Pjatniza Church (Церков Параскевы Пятницы на Торгу) from the year 1207. Above the Tvorg or market place, we find the Transfiguration Church (Церковь Спаса Преображения на Ильине улице) from 1374. 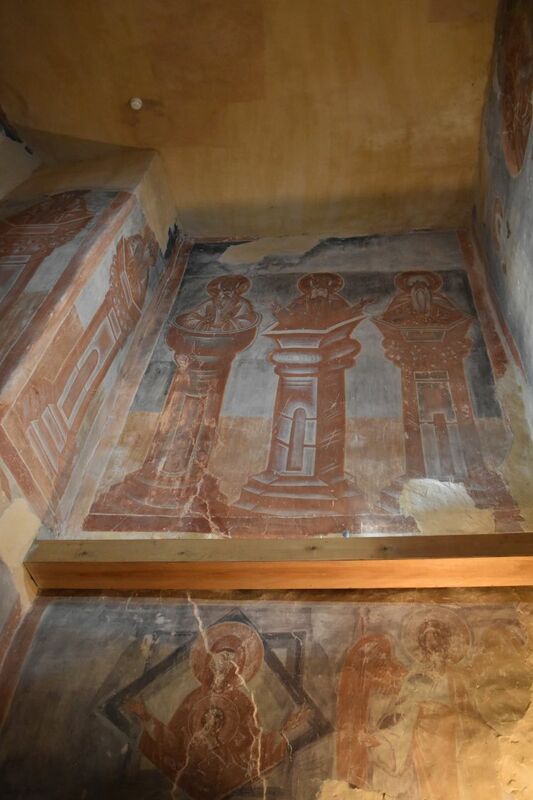 It contains frescoes by Teophanous the Greek from the 1370ies. He is one of the few icon painters known by name. His style is almost abstract and he gives perspective to his figures by adding white lines. 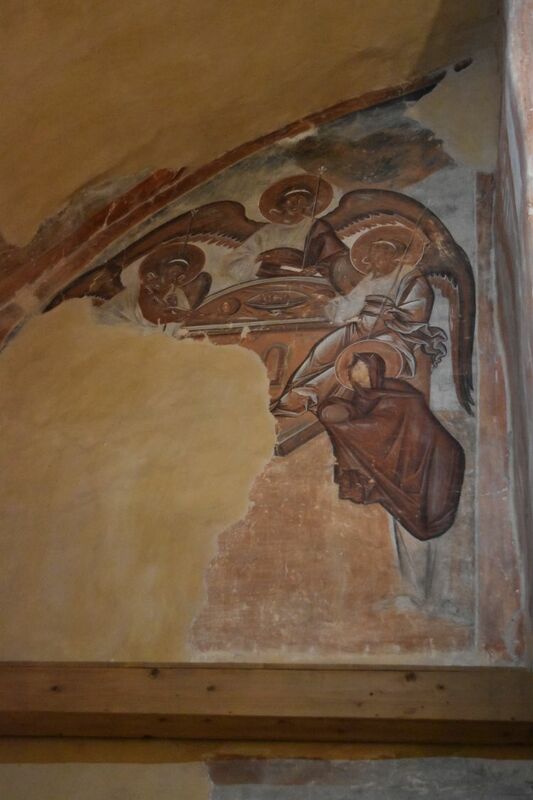 One of his frescoes shows the Old Testament Trinity, when the three angels – “disguised” as vagabonds – ask for food. They are rejected, until they come to the house of Abraham and Sarah. I listen to a guide who tells the story to a family with a young boy – very kind, how he explains that these angels looked like vagabonds or бродяги – would you have invited them? 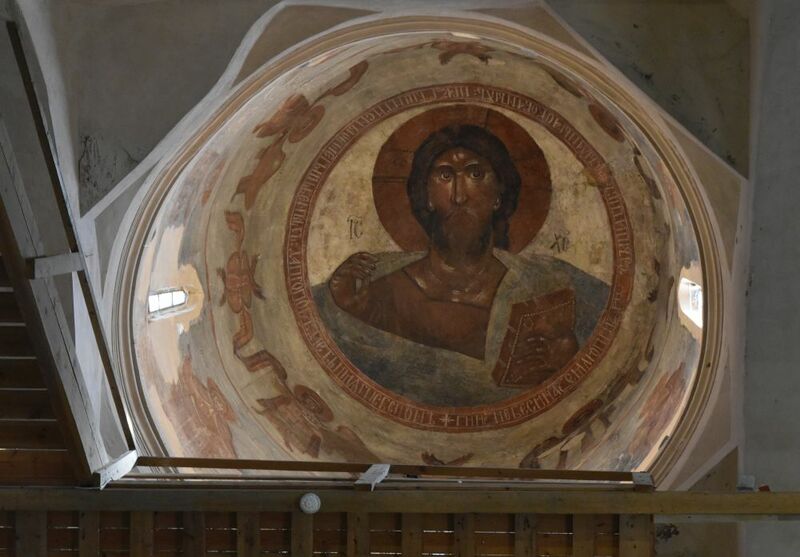 In the dome there is the Pantokrator of Teophanous. And then we find three saints sitting on columns – I simply cannot imagine, how that works – sitting on a column day in and day out. Next to the Transfiguration Church are the domes of the newer Snamensky Church from the 17. Jh. Enough culture – we need a rest and book an hour on a boat. Along the river Volkhov the boat takes us to the Ilmen Lake. On the way we see the Juriev monastery that we will visit tomorrow. The Ilmen Lake is very, very large. We cannot see the opposite shore line. 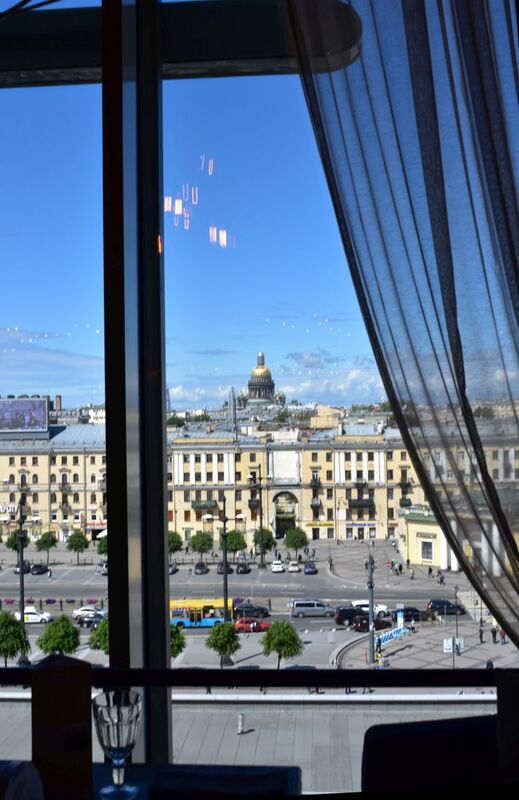 We have dinner in the Volkhov hotel on the fifth floor balcony. A great view and a good service. Then we sleep well in our luxury room to be ready for a sunny Sunday with more sightseeing in Novgorod. 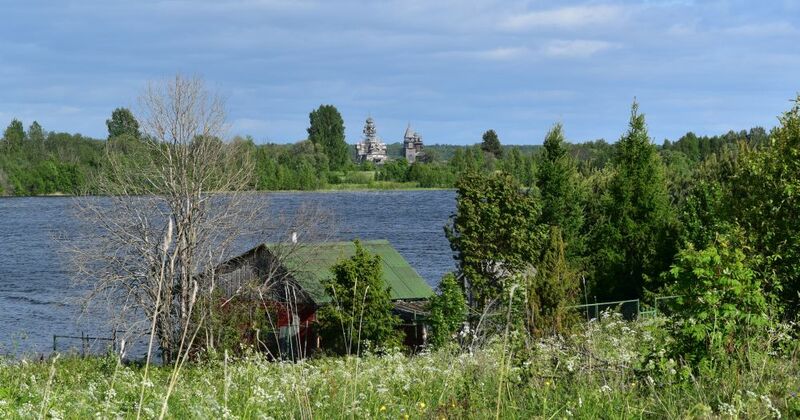 Kizhi (Кижи) is a small Karelian island in the Onega Lake. With the gorgeous Transfiguration Church and its 22 domes, it has been an old dream of mine – one of these destinations of a lifetime. 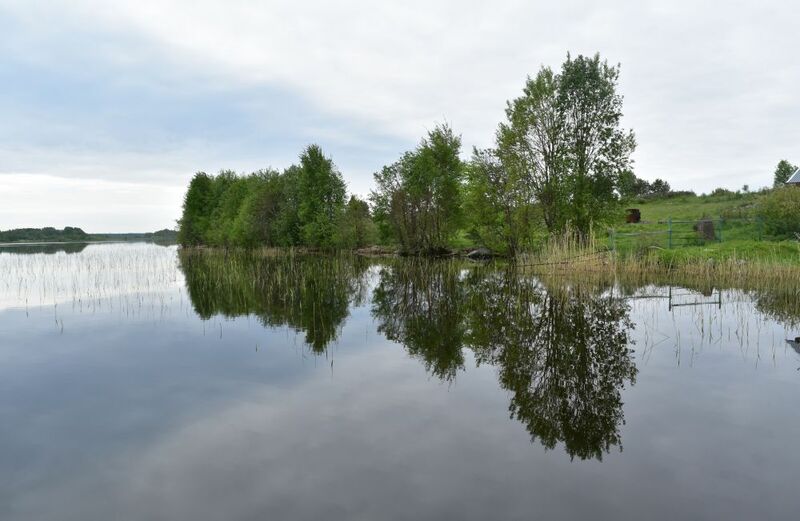 While staying in Petersburg, we plan an excursion to Kizhi – for a few days to experience Kizhi and Karelia more intensely. In the internet, Ursula has spotted the guesthouse Grace or Благодать. It is the only hotel within reach of Kizhi. It is located in the tiny village Ersnevo (Ерснево). I call Tanja, the owner. She is very friendly. 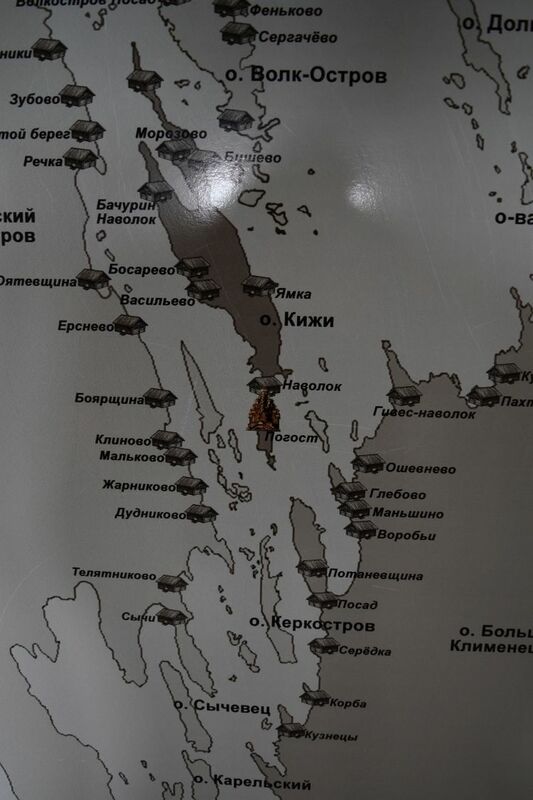 “Yes you can stay two nights and we have a boat service to Kizhi”, she says. I reserve two nights with meals. 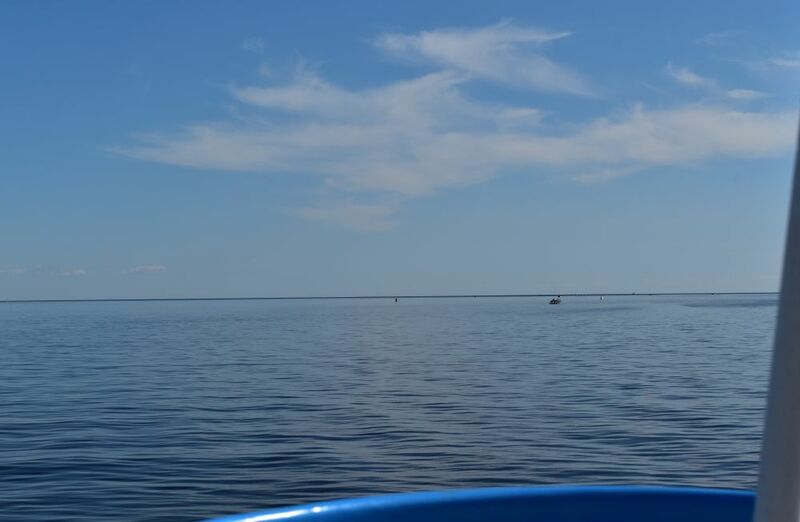 From Petrosavodsk bordering the Onega Lake, three hydrofoils (“meteors”) leave for Kizhi in the morning (the first at 9:30 am), and the same three hydrofoil boats return to Petrosavodsk in the afternoon (the first at 3:00 pm). In the morning they take tourists to Kizhi and in the afternoon they bring them back to Petrosavodsk. This is a daily service. Tourholding operates the hydrofoils. I call them and reserve tickets for the first Friday morning boat at 9:30 a.m. and return tickets for two days later – Sunday 3 pm. 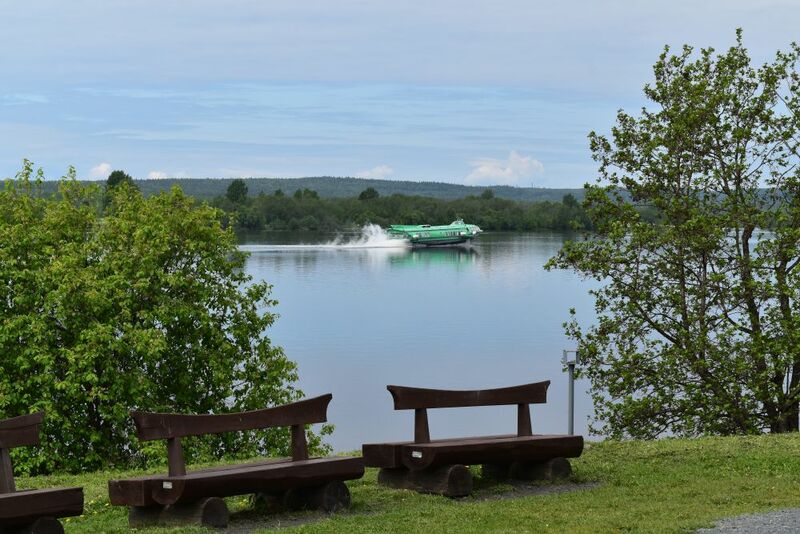 Our train from Saint Petersburg will arrive in Petrosavodsk late in the afternoon and therefore I reserve one night in the Karelia hotel not far from the peer or причал to catch the first hydrofoil boat in the next morning. 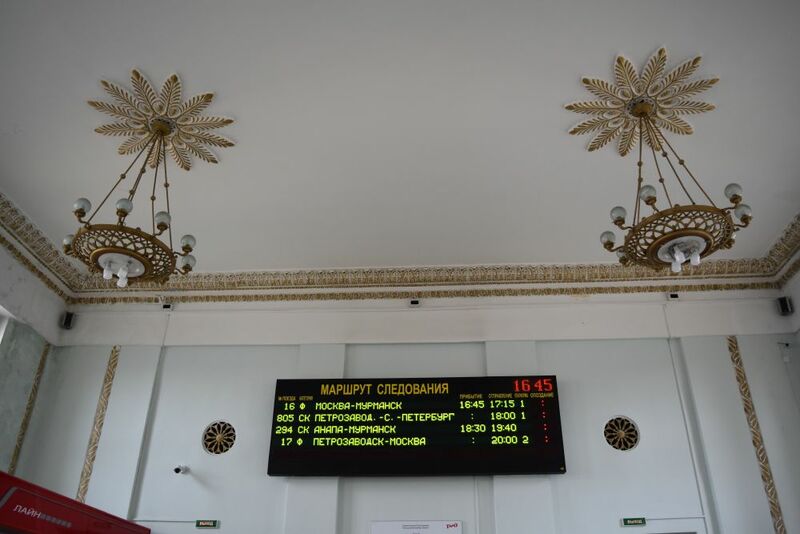 Hotels and boats reserved… now we still need train tickets from Saint Petersburg to Petrosavodsk and back. Be aware: To buy (long distance) train tickets in Russia, you have to show your passport! At Ladoga station, we wait in a very slow queue. One hour later and just three minutes (!) before our booth closes, we have finished buying our train tickets. Uff! 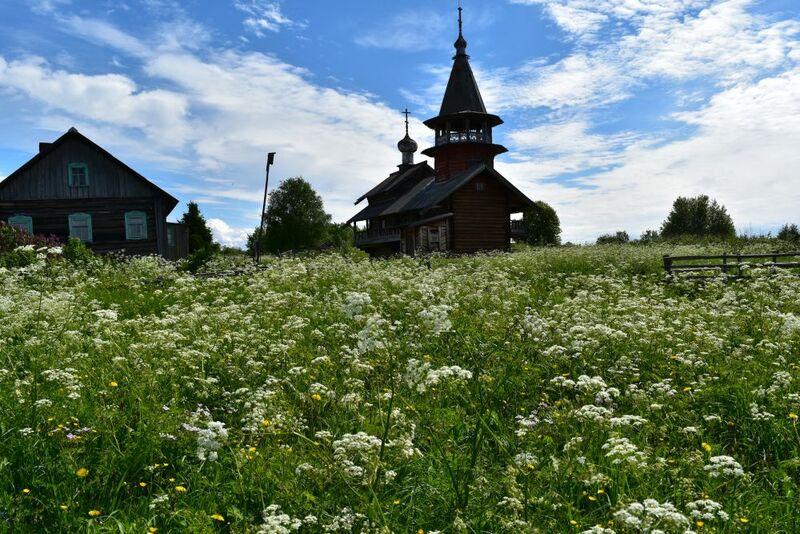 We are ready for Kizhi and our dream, the wooden Transfiguration Church with its 22 domes. 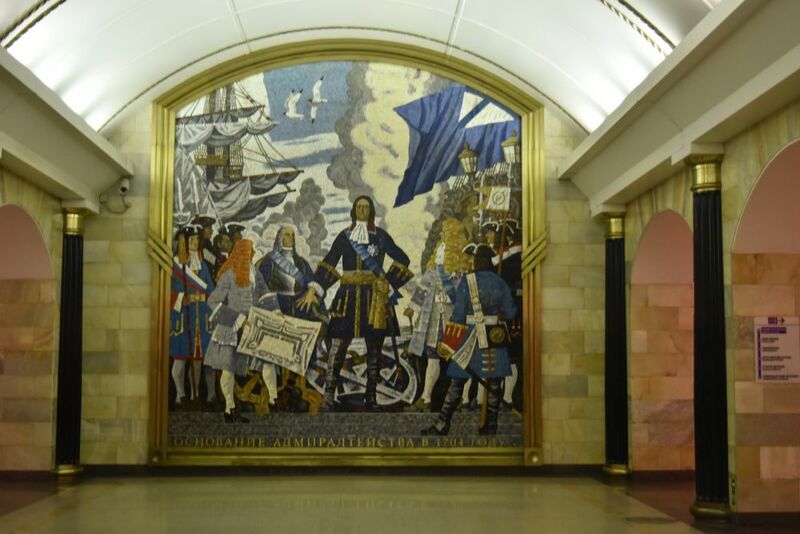 On Thursday morning, we board the train at Ladoga Station in Saint Petersburg. The train leaves exactly on time, 9:55. We travel in a so called Obschy Wagon (общий вагон) with couchettes. We have a compartment for us alone and stretch out on the couchettes, while the Karelian forests and some wide rivers fly by the windows. 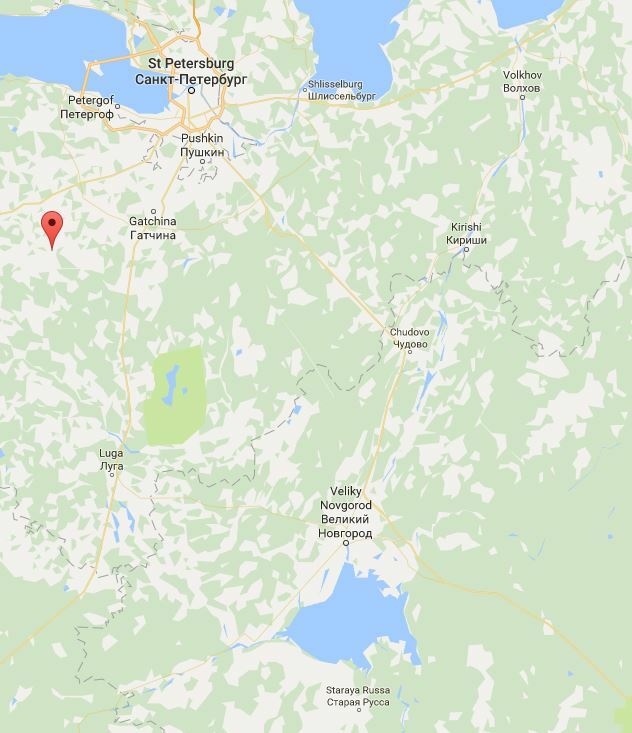 Seven hours later we arrive in Petrosavodsk (500km north east of Saint Petersburg). Peter the Great has founded this industrial town in the same year as Saint Petersburg (1703). 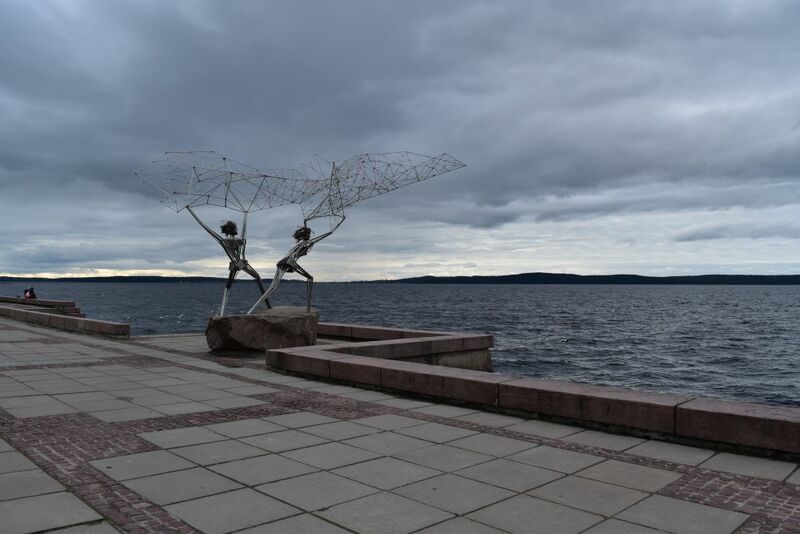 The promenade invites for an evening walk along the Onega Lake. I meet an old man who sells his book about the winter war in the 1940’s, when Russia conquered East Karelia again. He is so kindly proud of his book that I buy it. We spend the night in the Karelia Hotel. At 9:30 a.m. our hydrofoil boat leaves, exactly on time. It is raining heavily. One and a half hours later we approach Kizhi. 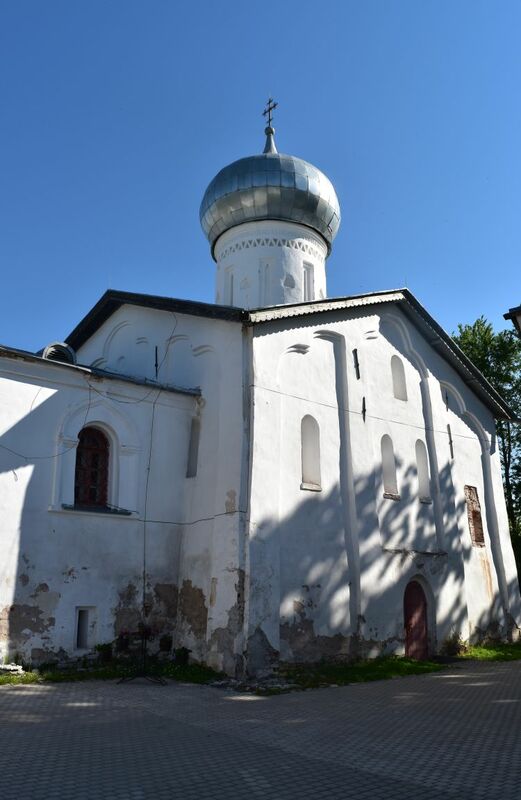 This is what we look forward to seeing: The 22 dome Transfiguration Church (Церковь Преображения Господня). 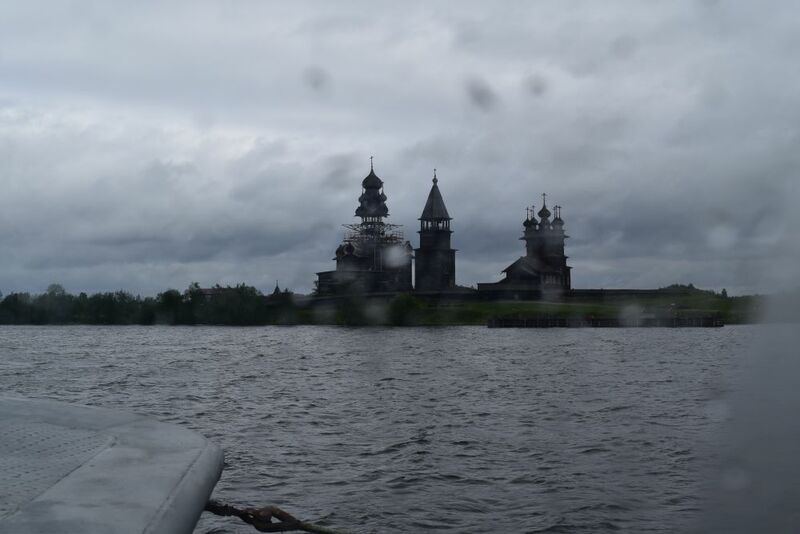 And this is what we see through the hydrofoil window that is damp from the rain: The Transfiguration Church is topped with about five cupolas… the other 17 domes have been removed for renovation. Big disappointment about the church of our dreams. In addition it is raining. We decide to go to our hotel on the neighboring island. Tanja picks us up and the boat jumps across high waves. A tea warms us up. 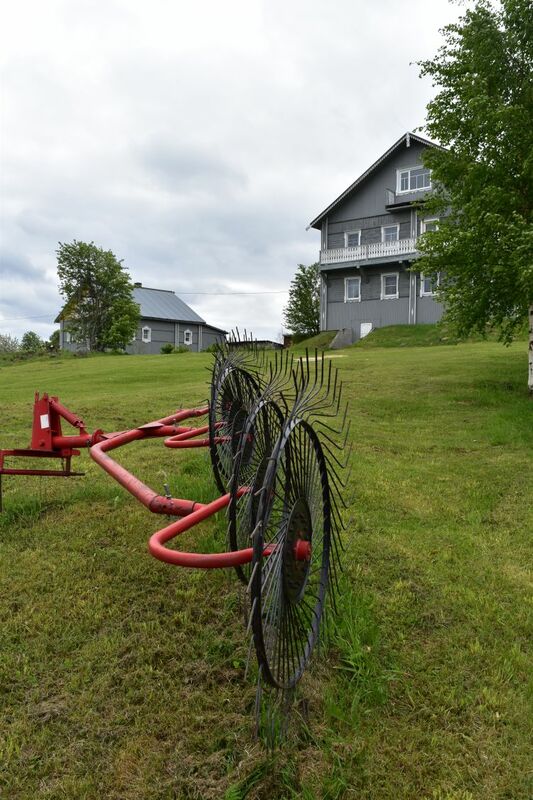 Our Guest House is also a farm, and they offer what the farm gives: Eggs, milk, cheese, quark (творог) and fish from the Onega Lake. 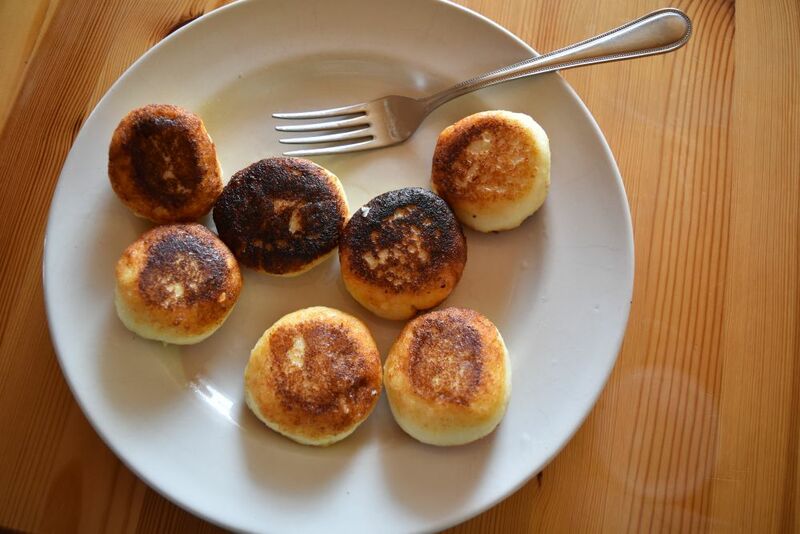 I particularly like the syrniki or сырники. 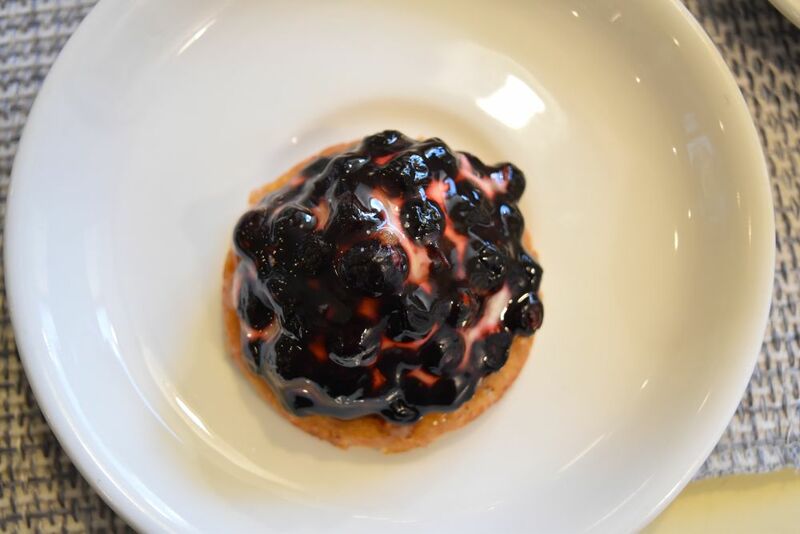 A recipe to take home! 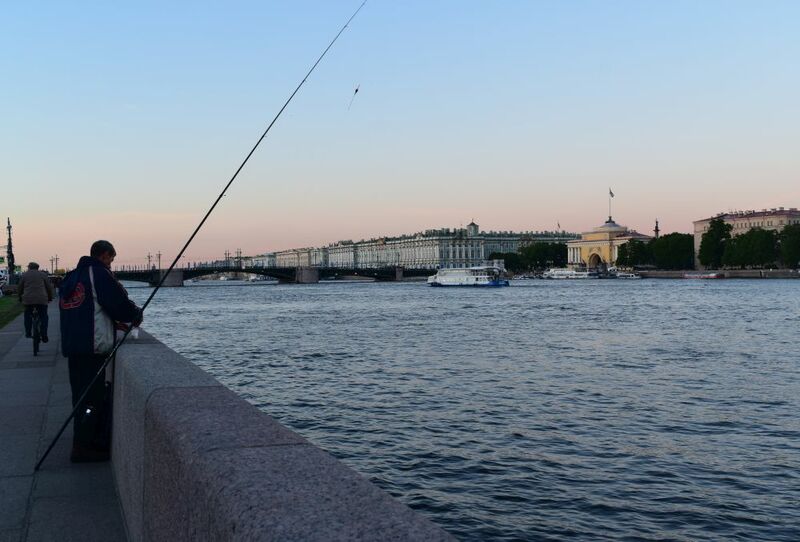 Fishing is an important sport in Russia requiring mastering and tactics. 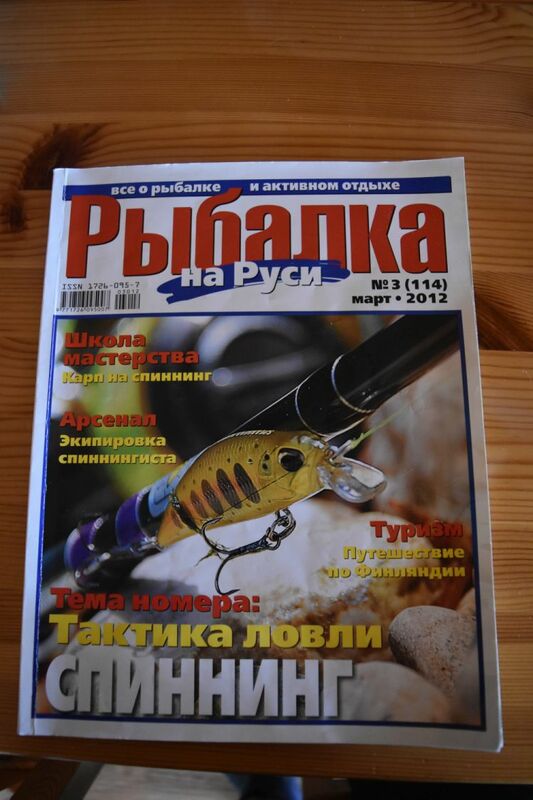 This newspaper teaches the school of mastering the fishing (школа мастерства). It has stopped raining and we walk along our island. It is quiet and peaceful. The wind plays with the Onega Lake. We catch a view of the central Kizhi church complex with the Transfiguration Church (now under renovation) and the Intercession Church. 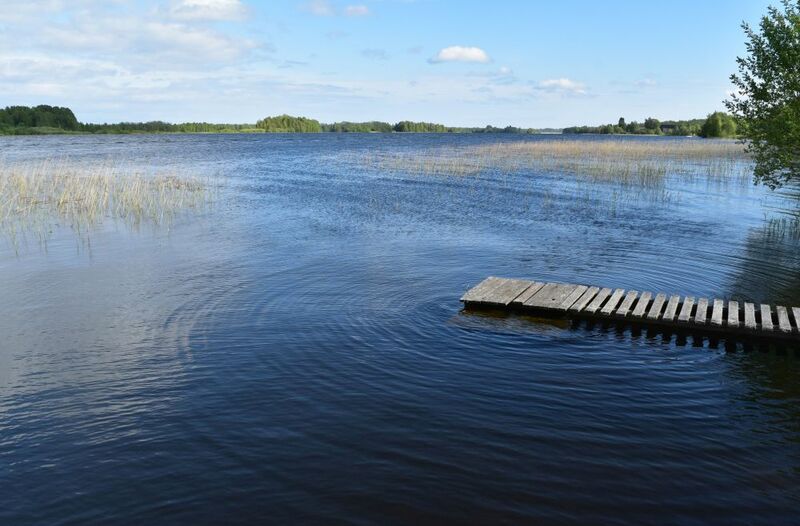 We have a chat with a lady journalist who writes articles in the local Karelian newspaper – in the local Karelian language that is related to Finnish. In the next morning the wind has stopped. The trees are now reflecting in the lake. 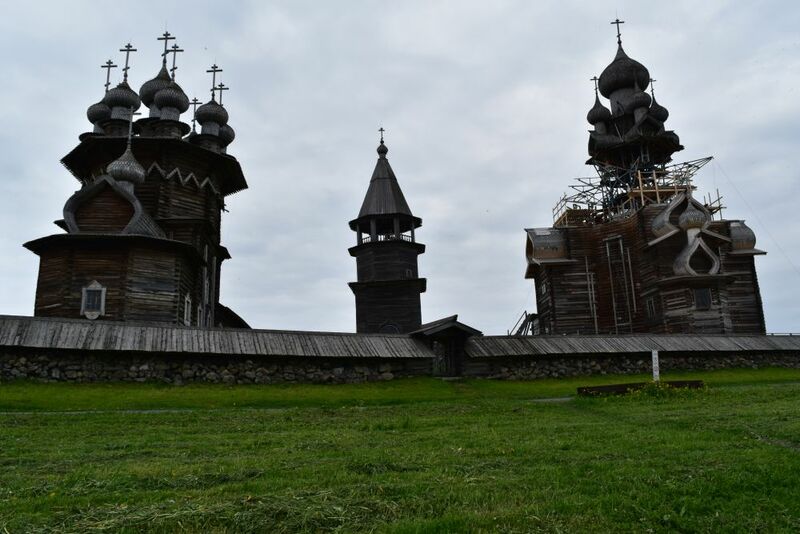 After a long breakfast we head for Kizhi to see the wooden churches and wooden buildings at display in the museum of Kizhi as well as to walk and visit the villages on the island. The Transfiguration Church (the 22 dome church now under renovation, Verklärungskirche) and the Intercession Church (Mariä Schutzkirche) are surrounded by a wall. We have bought a pretty booklet that translates Intercession or “Покровская” with “Maria Deckung Kirche”. Both churches are from the 18th century. The walls are made from pine wood (сосна, Kiefer) and the domes from aspen (осина, Espe). The aspen domes shine in the sun, as if they were made from silver. The Intercession church can be visited. It consists of three consecutive rooms. 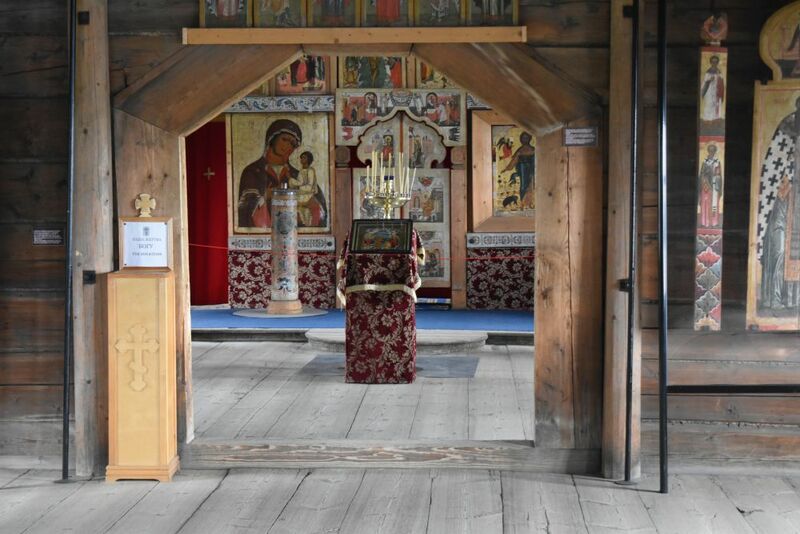 This is the view of the iconostasis, as seen from the second room. The Transfiguration and the Intercession churches have always been the main churches for the area, whereby the latter can be heated in winter. 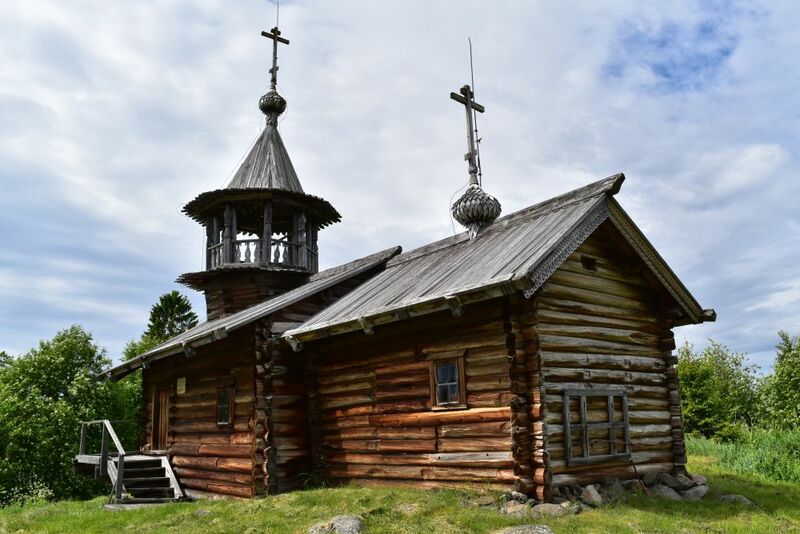 Around the churches of Transfiguration and Intercession, we find a museum of wooden houses, barns and wind mills as well as more wooden churches brought to Kizhi. This is the farmer’s house of Oschewnewo (Ошевнего). This is the church of Archangel Michael amidst cuckoo flowers. The church of Lazarus is from the 14th century. 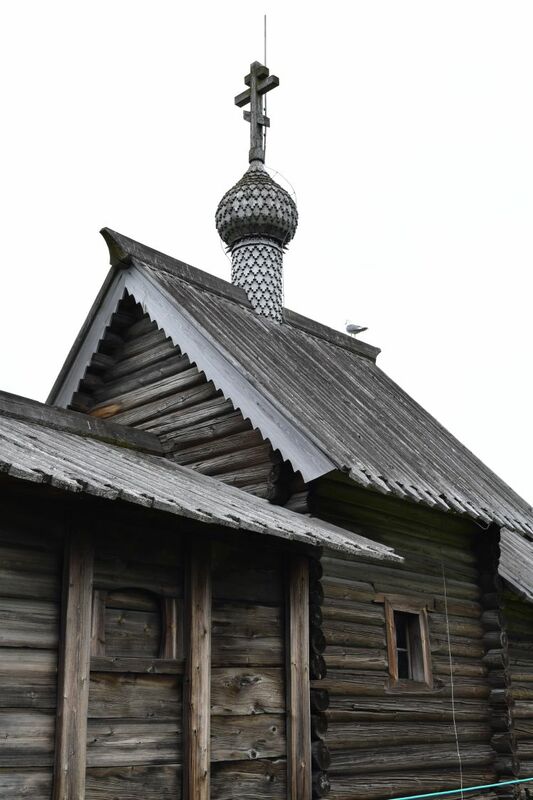 It is the oldest church in the Kizhi museum. 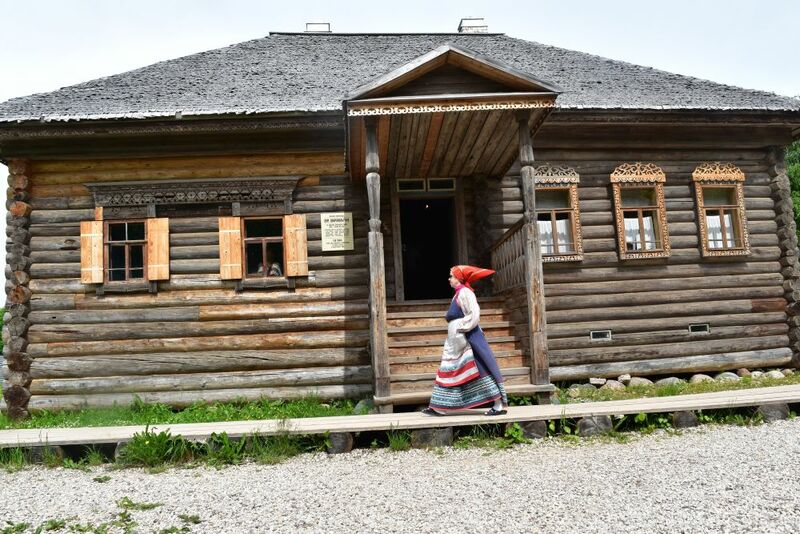 The island Kizhi is not only a museum, but also a “normal” island with “normal” villages where people live in their wooden houses. 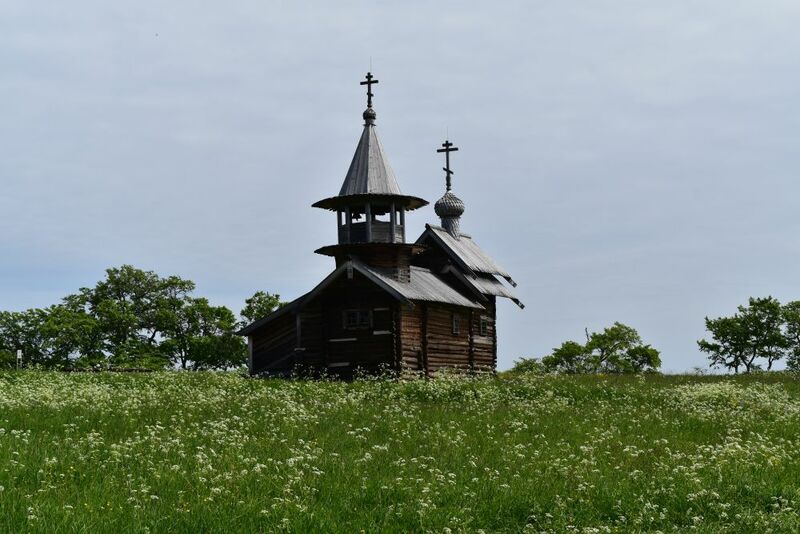 Kizhi was one of the places where the Old Believers (Raskolniki, расколники)) retreated after the Orthodox schism of the 17th century. This is a beautiful house in the village Vasiljewo (Васильего). 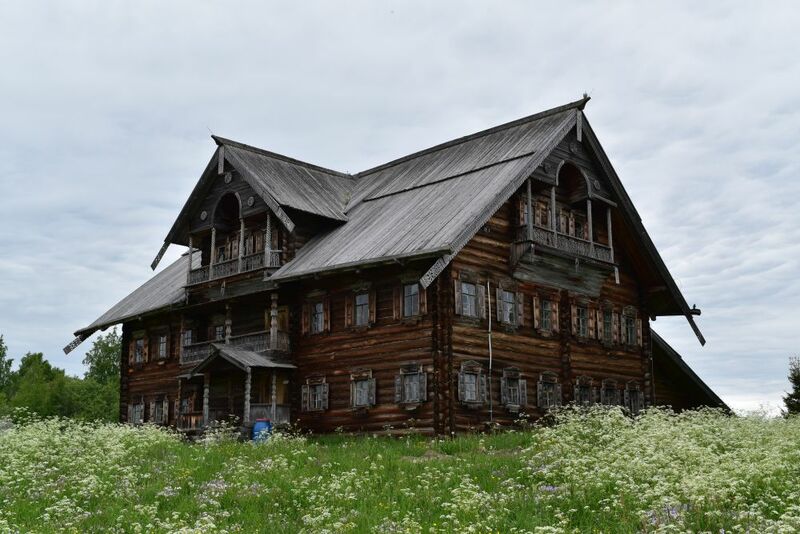 After a long day walking on the island Kizhi, we return to our friendly guest house Blagodat or Grace. We get up at 2 a.m. in the middle of the night and take pictures. On our last day our host takes us for a two hour boat trip to visit six more churches and three more villages. This is the chapel of Peter and Paul in Volkostrov (часовня Петра и Павла в Волкострове). This is the chapel of the Three Saints on Kizhi (Часовня Трёх Святителей, on the other far end of the island). We learn that only few people still live in these villages for the whole year. Most houses now belong to people from the town. They use them as their datschas. 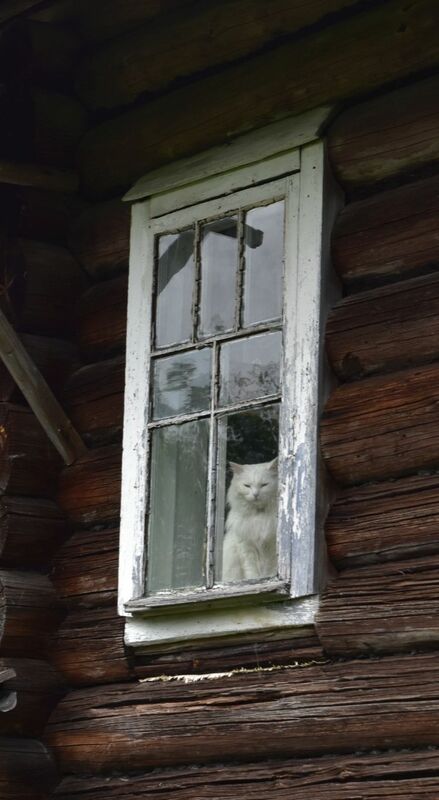 In Vorobji (Воробьи), we say hello to this small white cat and have a chat with the owner of the house. 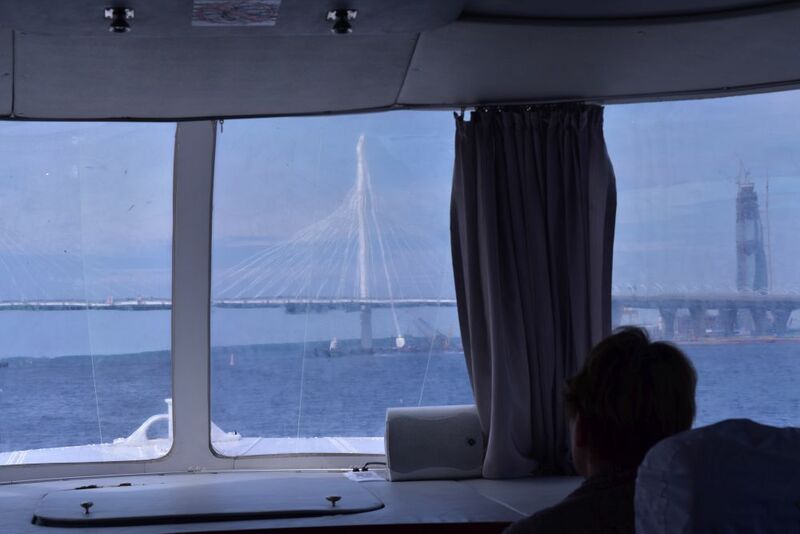 In the afternoon we take the hydrofoil back to Petrosavodsk and at six (precisely on time) our express train leaves for Saint Petersburg. 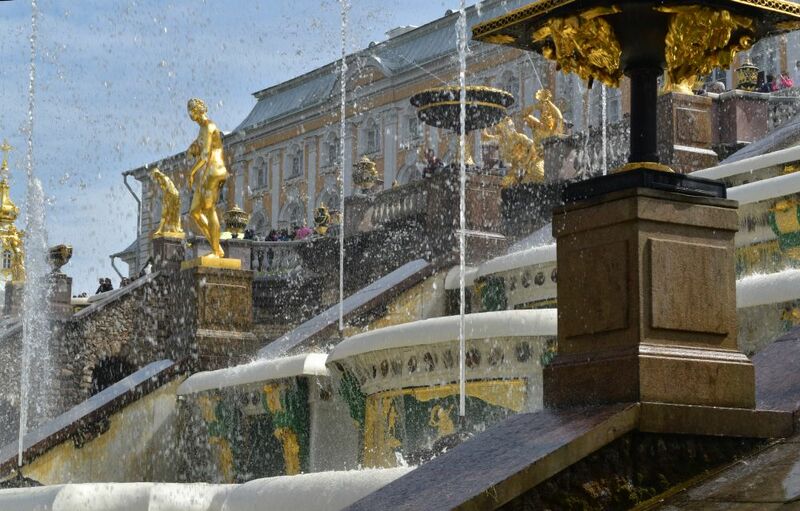 Culture – so much culture in Saint Petersburg. We could not get enough of it – and from time to time we had to relax. And Petersburg is also great for that. 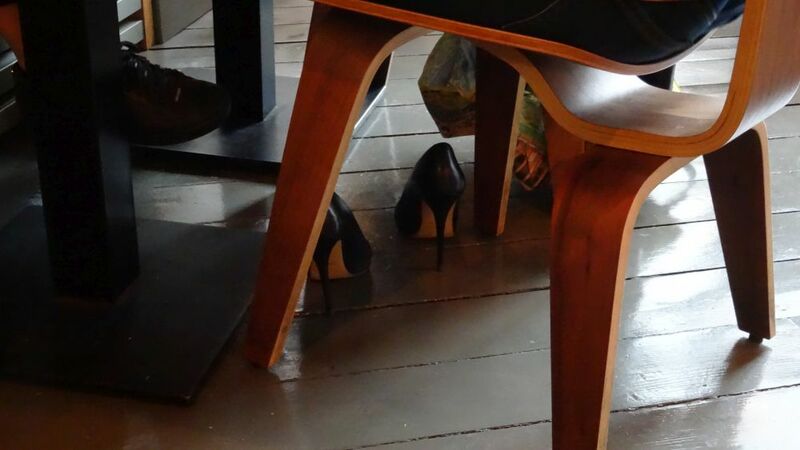 We return to the Newsky Prospekt again and again, enjoying breaks in one of the many coffee houses while admiring the Russian ladies walk elegantly on their high “pencil” heals. This was the Volkonsky restaurant where I had an excellent okroschka (cucumber soup on kefir, also served on kwas) and blackberries on fresh cheese on a bisquit – easy to prepare and delicious. Ideas to take home! We also had an excellent ice cream in the posh hotel Europe (at normal prices). 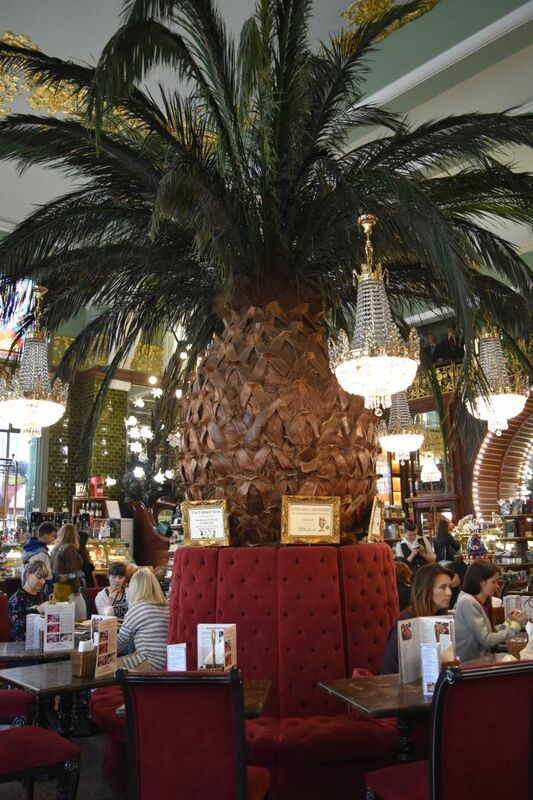 Wherever we stopped we enjoyed the atmosphere, the meals, the desserts, the coffee and the service. 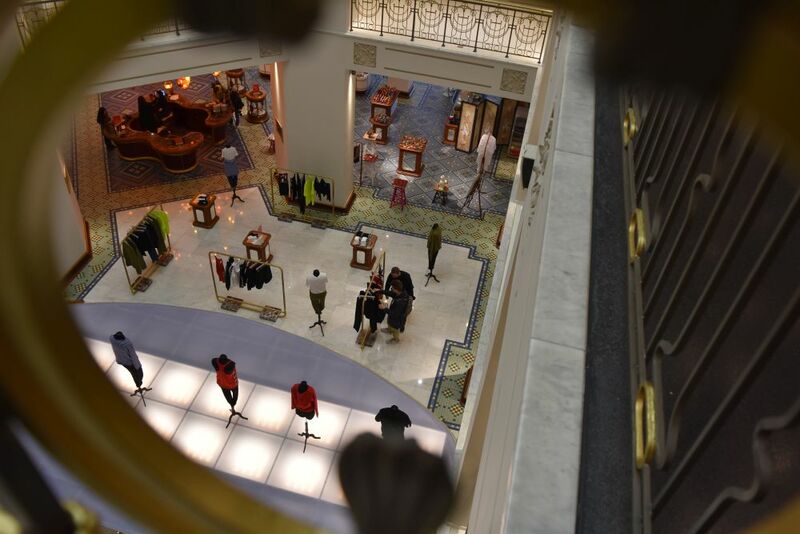 The Gostiny Dvor is the traditional department store originating from the late 18th century. It consists of a gallery of shops arranged around a triangular court yard. This “guest court” is an interesting neoclassical building. However, we find empty shops, high prices and unmotivated shop assistants. Also the Dom Knigi has changed. What a pity for this nice art nouveau building. However, there are many excellent smaller and bigger shops at and near Newsky Prospect. A great address for gourmet gifts is the beautifully decorated Jelissejew shop where we buy delicious date confectionaries for our friends. Russians love pralines. We very much liked the department store “Au Pont Rouge”. It has recently been renovated celebrating now its 110 years amniversary. 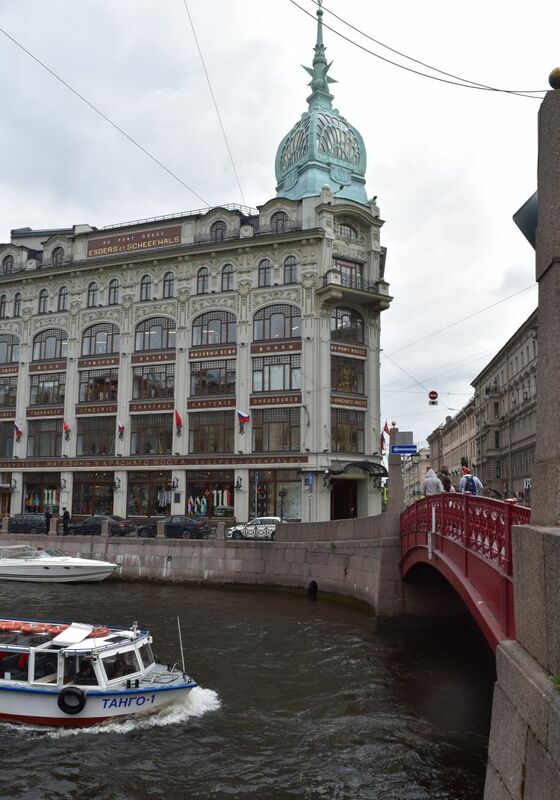 It is luxury store overlooking the red bridge of the channel Moika. Here we try some wonderfully designed dresses supported by a very, very friendly shop assistant. 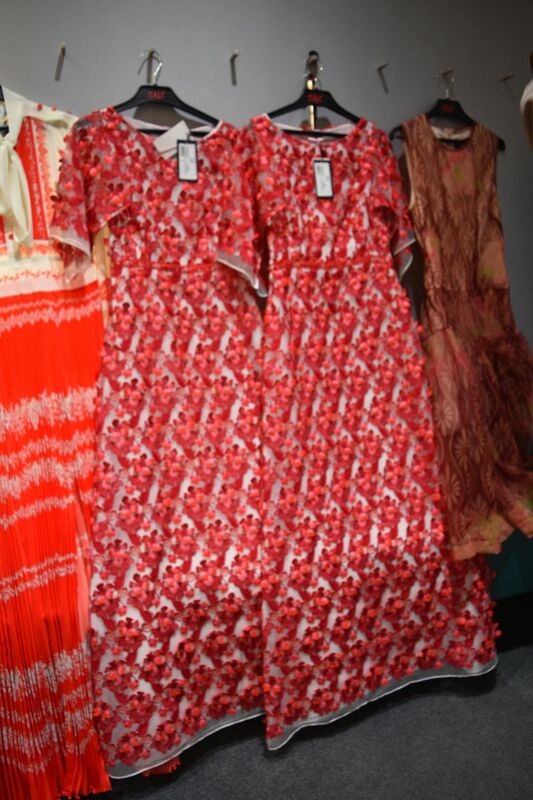 Without buying anything we savour the atmosphere and dream wearing the design dresses. 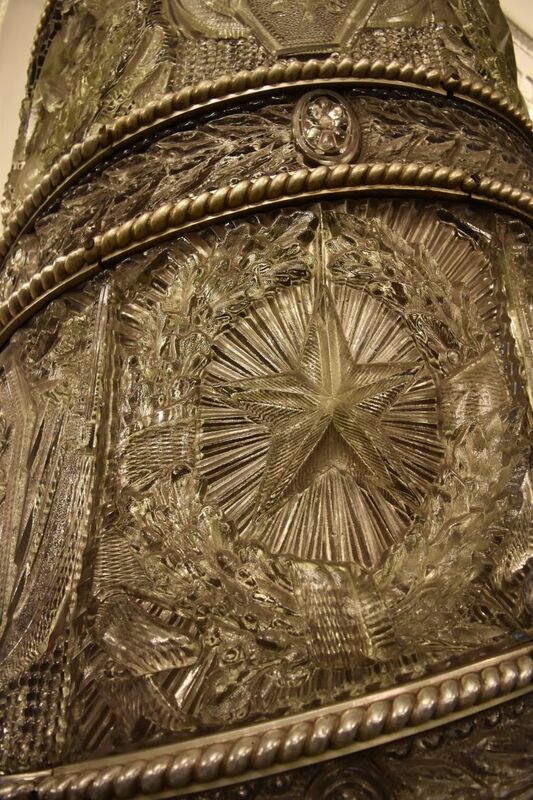 Some designs are of Russian origin. Not far from the Au Pont Rouge, we find a great outlet shop where we buy an elegant jacket for Ursula. In the Pik overlooking Sennaja Ploschtschad we buy a nice jacket for me – ice rosa – and we have lunch in the restaurant on the top floor with a great view of the city. Shopping is also great in the Kuznechny Market. 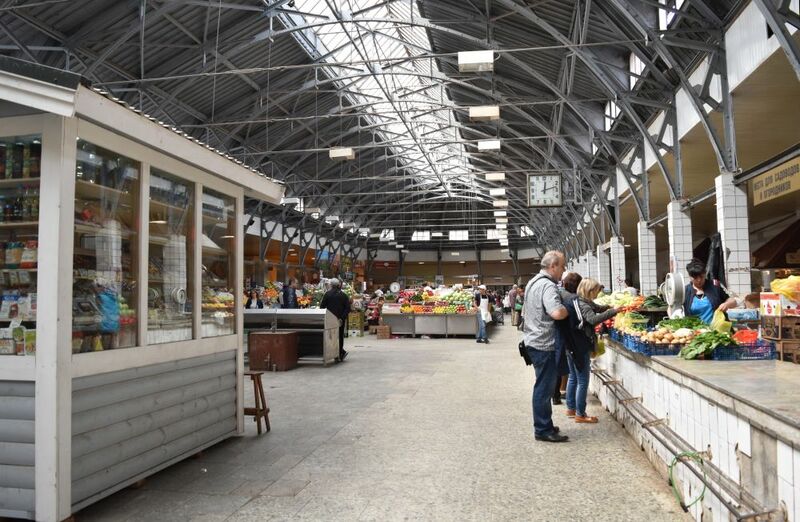 Fruit, vegetables, meat and also antiques as well as Russian souvenirs at reasonable prices. Here we buy gifts to take home, for instance potholders with tasteful Matrjoschki patched on to them. And from the food stalls we acquire dates, tea and chocolate. 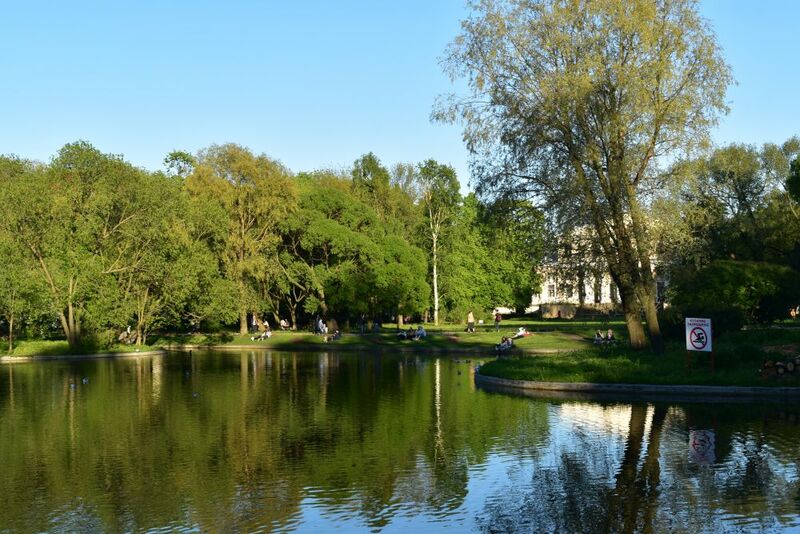 There are many relaxing parks in Petersburg. On a sunny Sunday we visited the wonderfully restored Summer Garden with its fountains. 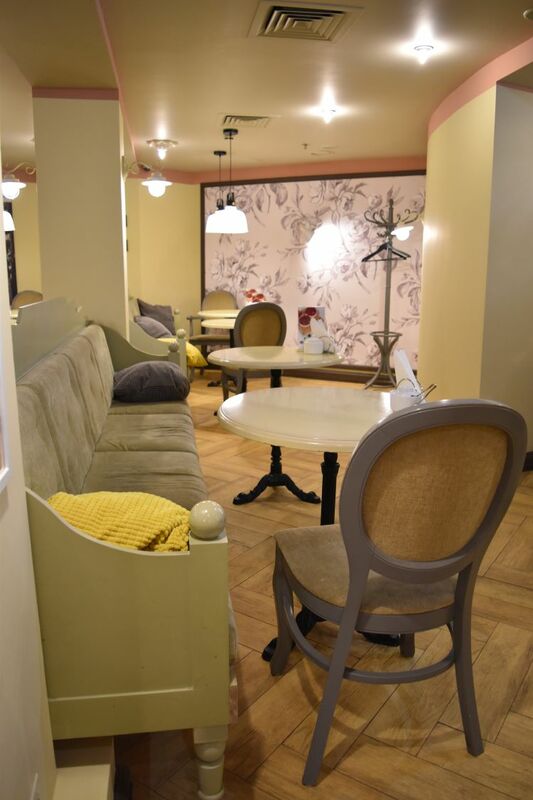 The cosy pavillons offer coffee, sweets and small dishes. The small castle is under renovation. 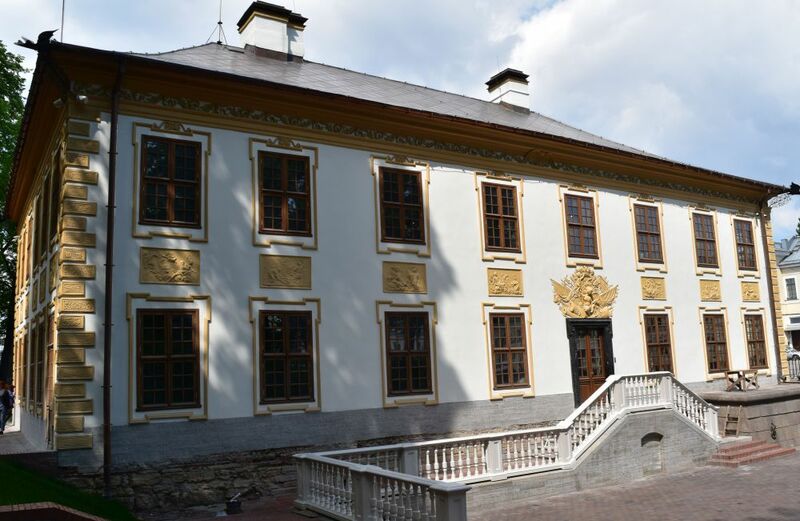 Peter the Great had again asked the Swiss baroque architect Trezzini to design this castle. 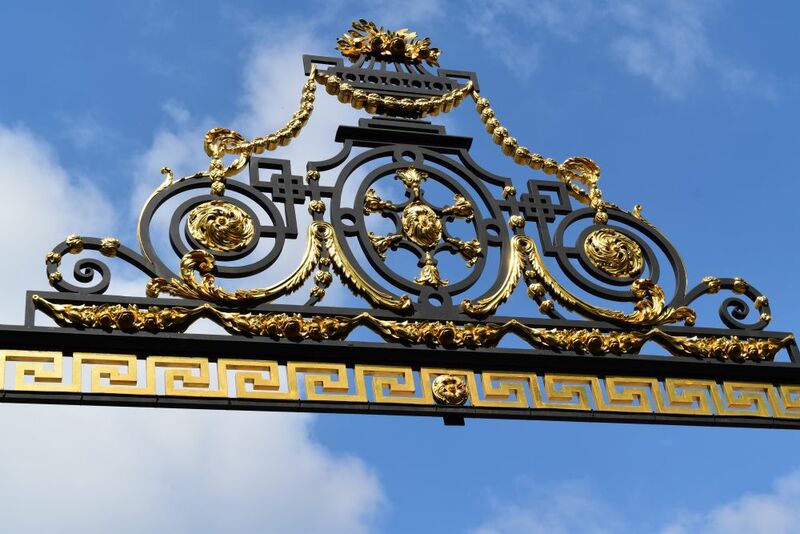 Particularly famous is the fence from the late 18th century – this is a detail of it. 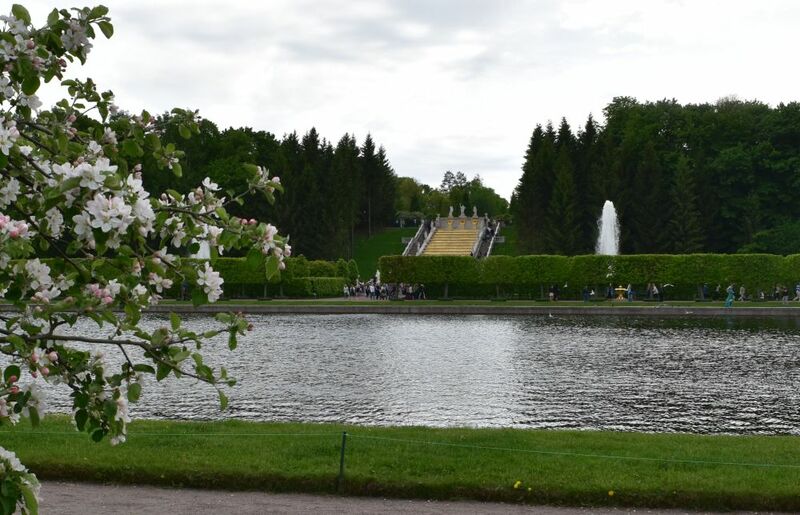 Another garden we liked was the Jelagin Park in the far north of Saint Petersburg. The neoclassical castle has been designed by Carlo Rossi. It was a warm and sunny day, when we strolled around the park meeting friends with their daughters. 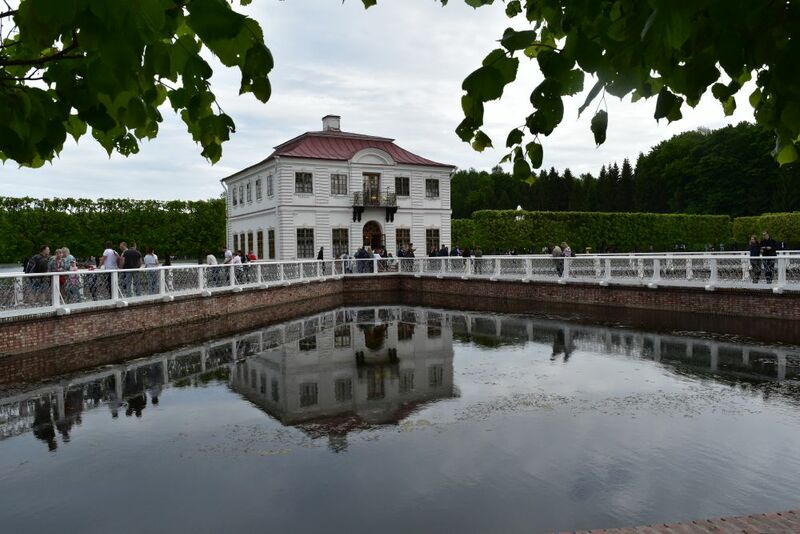 We were amidst many citizens from Petersburg that enjoyed the garden with the ponds and the Newa river. 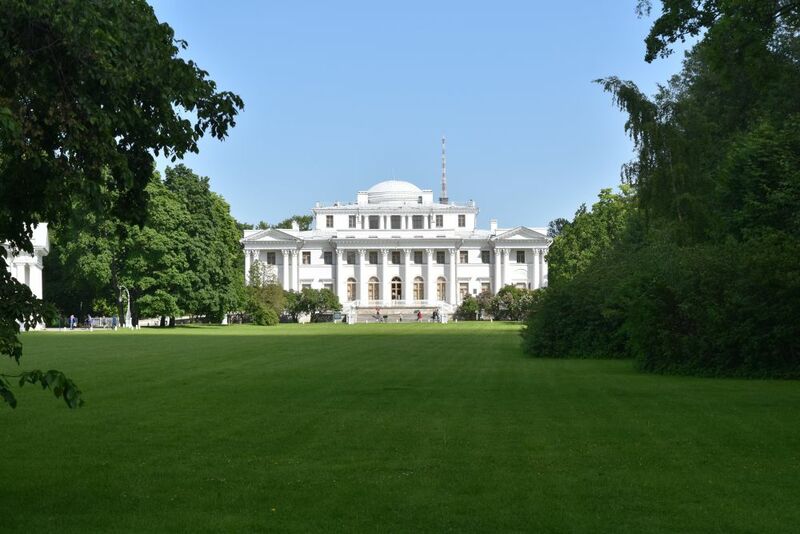 Jelagin and later the zars must have enjoyed it here on their island that is just ONE large garden surrounding one palace and a pavillon with another excellent restaurant. The Jussupow park is not far from our apartment – a great evening walk. On our way to the Smolny Cathedral we take a rest in the Tauride Gardens. 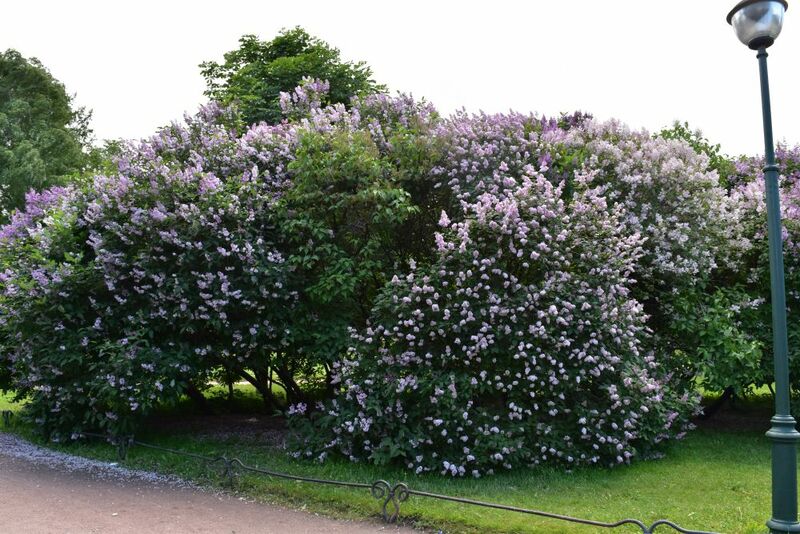 Syringa bushes are now in bloom in Saint Petersburg – it is a late spring. In New Holland we find beautiful herb gardens. We escape the pouring rain for a coffee in the friendly restaurant Deli. Soon the rain stops and we stroll around the island. Peter the Great had built New Holland to store the wood needed for his navy. The buildings are now being renovated, nicely hidden behind curtains. The hanging structure reflects in the pond. And with the twinkling of an eye, visitors are asked to wait a bit, before stepping on to the freshly sown meadow. 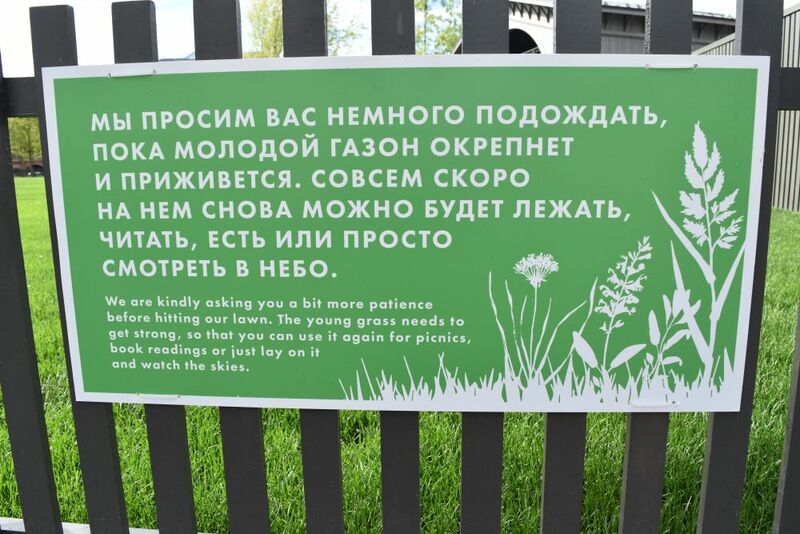 The grass has to grow first and strengthen – but very soon visitors will be allowed again to lie on the grass, read, eat or simply look into the sky. 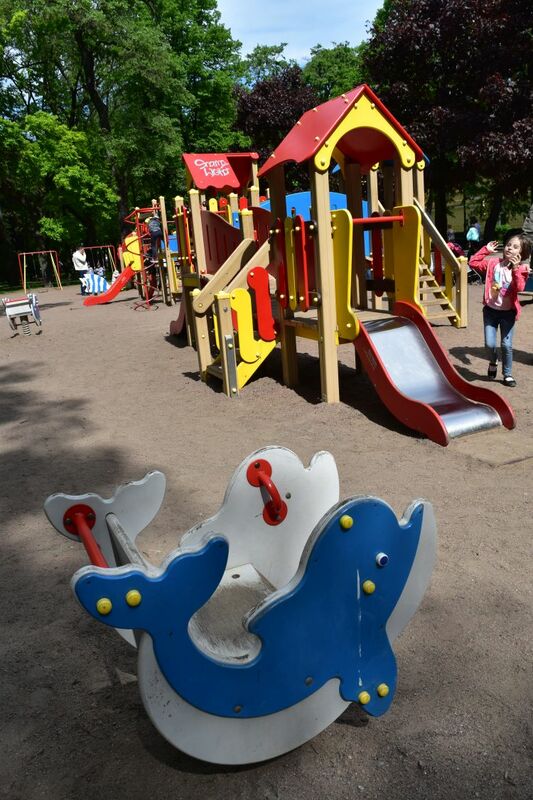 The parks are also kids friendly. Eating a standard ice cream in the waffle coup we join the kids playing in the Alexander Gardens behind the Isaac’s cathedral. 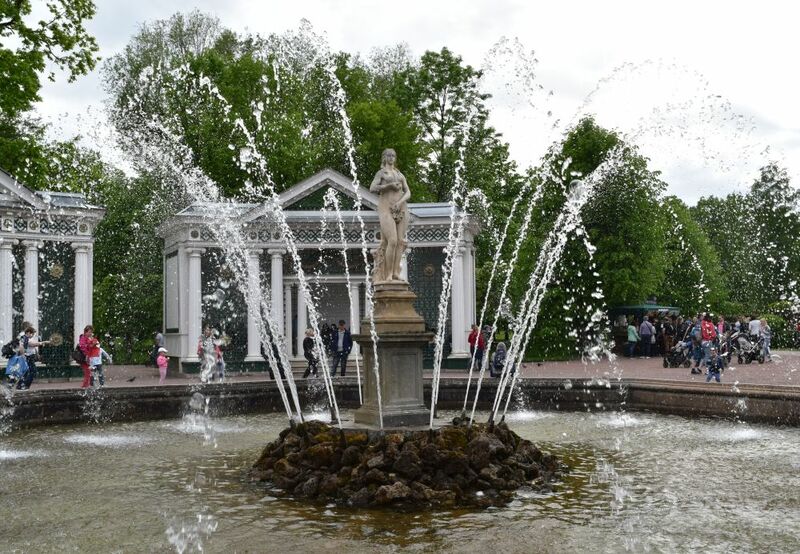 Yes, there are many parks, small restaurants and shops to relax in Saint Petersburg – and to be ready again to absorb the culture offered in this town. In June 2017, we are on the road again, this time to Saint Petersburg. It is my fourth time in Saint Petersburg. We live in a small appartment, about ten minutes away from the Isaac Cathedral. It is a cosy appartment with high ceilings. There is a lot to see in Saint Petersburg: The palaces, the museums, the Newsky Prospect, the Newa and the channels, the cathedrals and the monasteries. 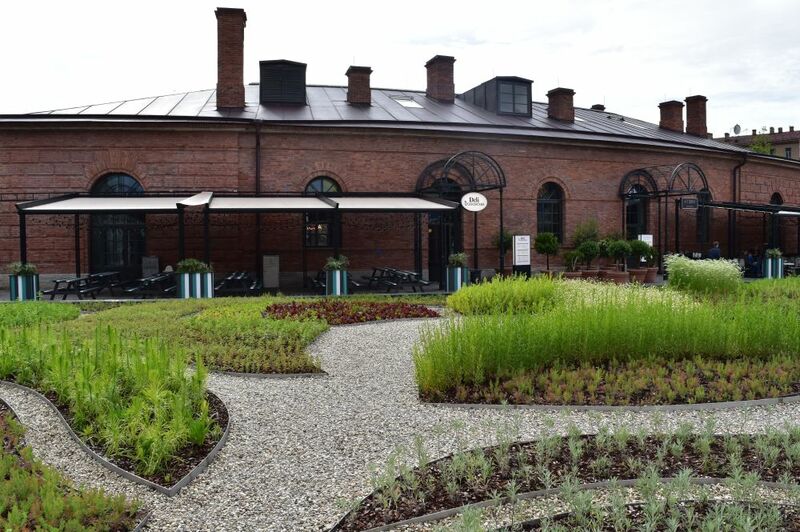 But Saint Peterburg can also be a relaxing experience with great shops, many cosy coffee houses, restaurants and beautiful parks. 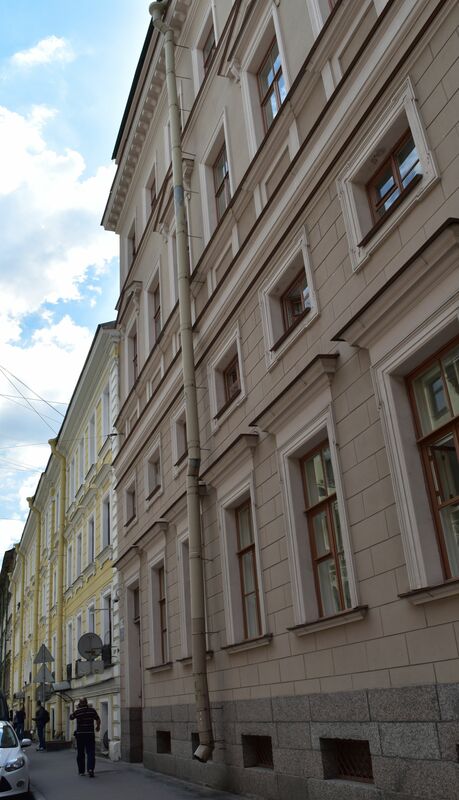 Since my last stay in Petersburg in 2013, I perceive that the city has become cleaner and many more houses have been renovated. From the Peter and Paul Fortress, there is a great view of the Winter Palace and the Ermitage bordering the Newa. It is the time of White Nights… late in the evening around eleven, it is almost day light. This is the late evening view from Vasilyevsky island. And yes, Russians love to do fishing (they call it рыбалка or rybalka). 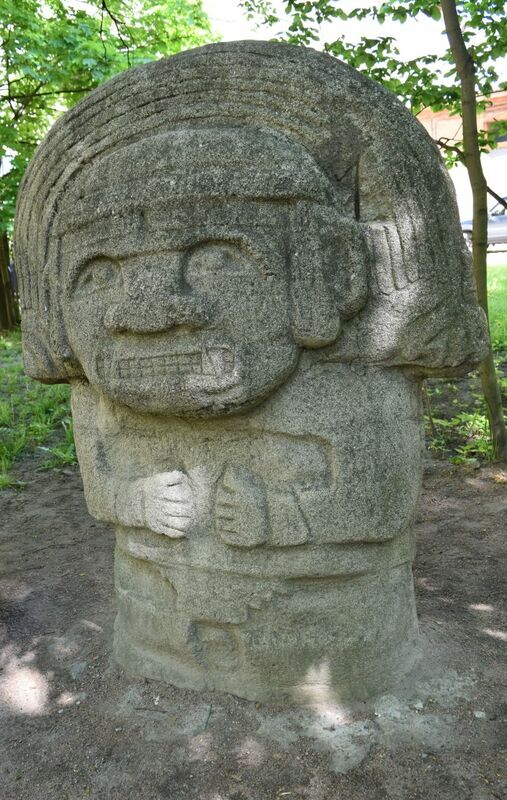 Not far from Strelka, there is a small park with Aztecan Gods. We ask them to abstain from bringing showers that can be a a very wet experience in Petersburg. Well… thank you, Tlaloc, you produced good weather for our excursions. And sometimes you caught us in heavy rain showers. In Petersburg, the clouds open suddenly and pour water on to the roofs and streets. The roofs cannot hold it back and the drains dump water on to the sidewalks. 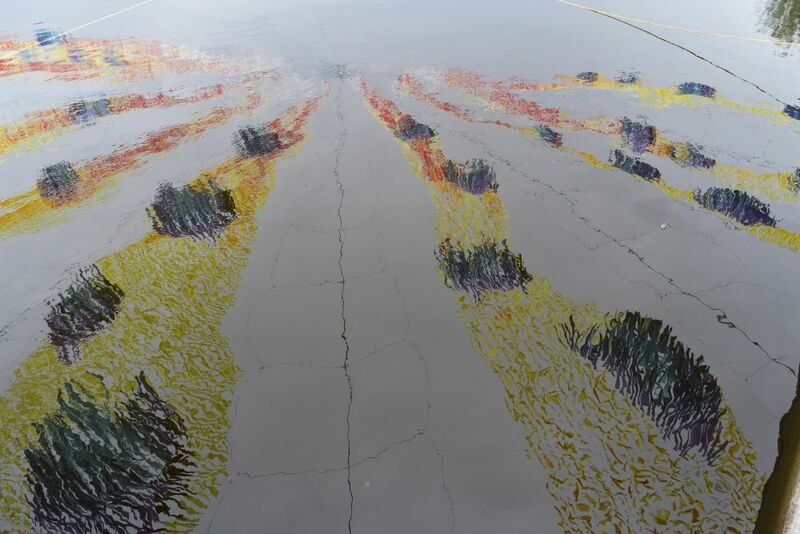 The result are deep puddles that pedestrians have to jump across. 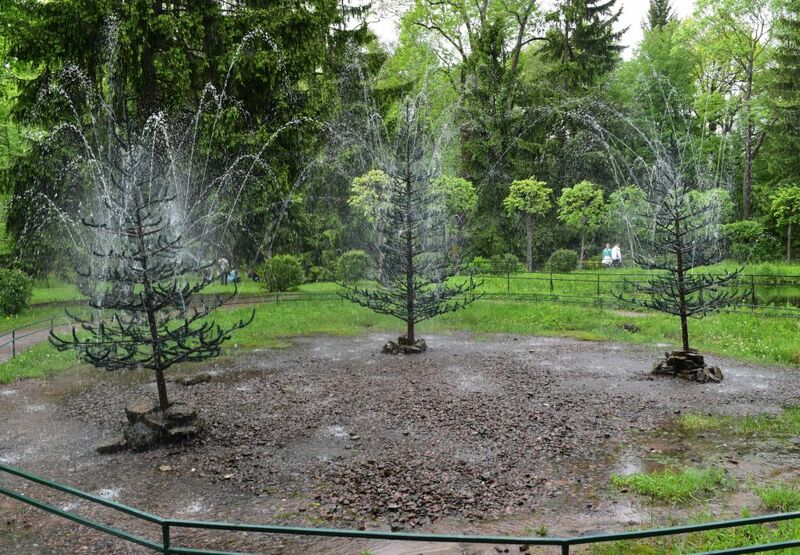 A “Petersburgian” shower makes everyone wet through within five minutes. The Newsky Prospect starts at the Alexander Newsky Monastery (one of the five most important orthodox monasteries called “Lavra” or лавра). We visited it in the pouring rain. For Novgorod, Alexander conquered Karelia from Sweden in 1240. The battle took place on the Newa, hence his name “Newsky”. Peter the Great felt related with Alexander Newsky, as he regained Karelia from Sweden. He asked Trezzini from Switzerland to build the monastery in Barock style. 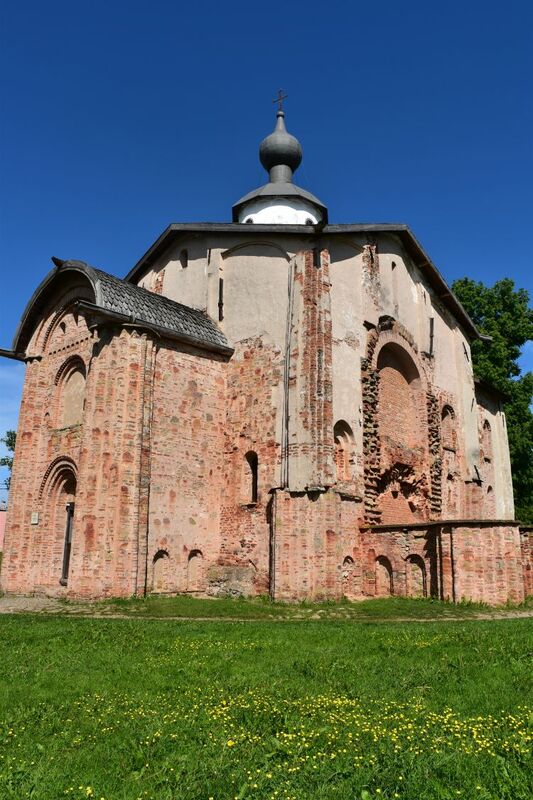 Starow, a Russian architect, completed the monastery in classical style. 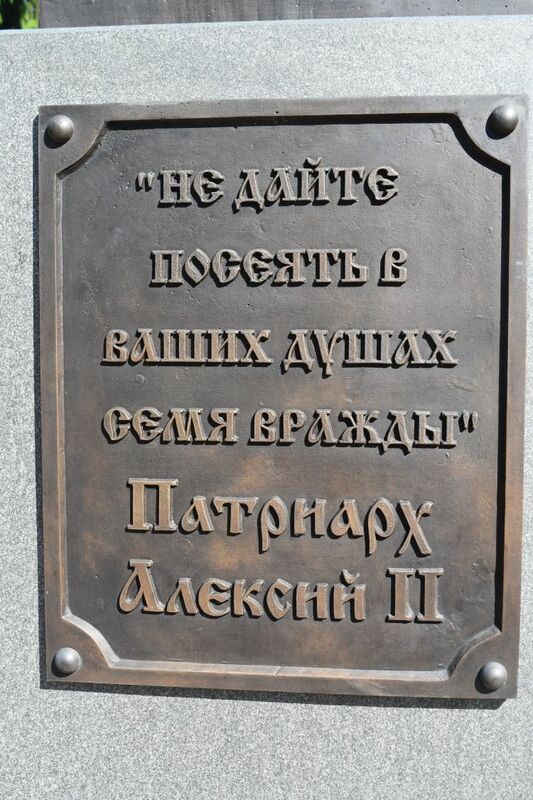 There are two cemeteries and Dostoewsky has been buried here. In 1703, Peter the Great started to build Saint Petersburg on the Hare Island fortifying it with the Peter and Paul Fortress. 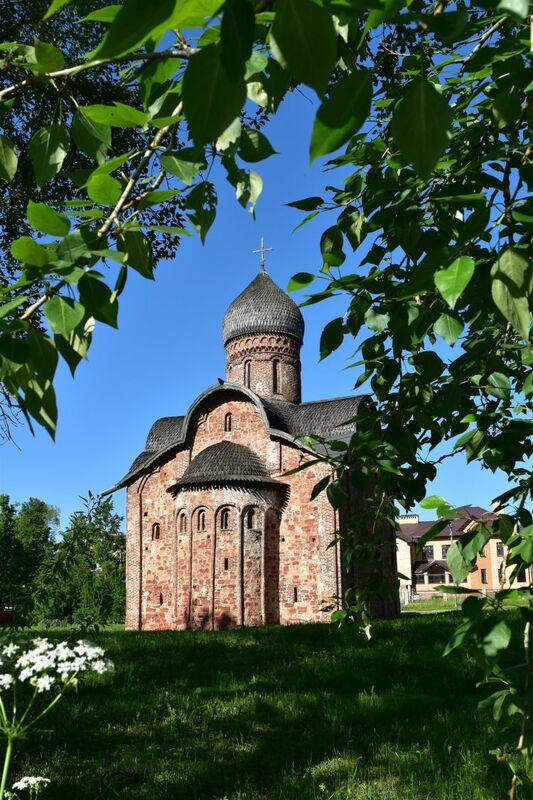 We stroll along the fortress and visit the Saint Peter and Paul church that – like the monastery of Alexander Newsky – has been designed by the Swiss architect Trezzini. The grave of Peter the Great is decorated with flowers. Outside we find his bronze statue. 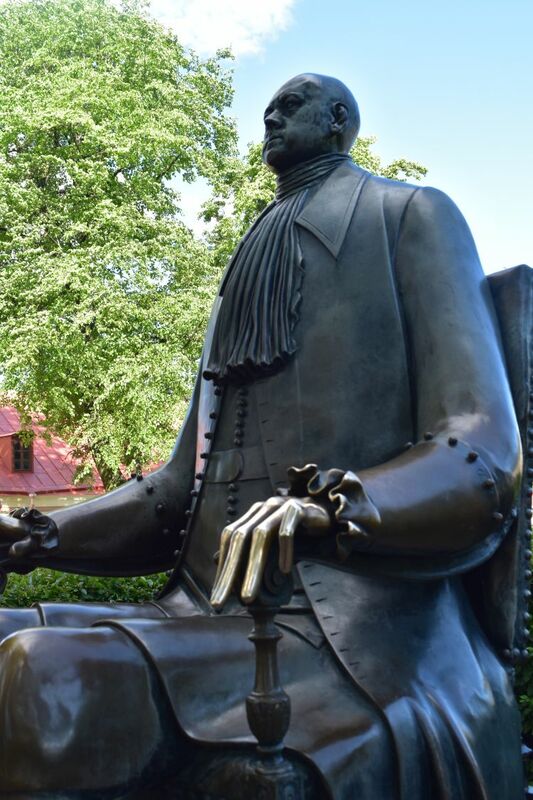 It has been created by Michail Schemjakin and it is controversial, because it shows Peter the Great as a tall man with a small head (he was more than 2m tall and his head was, indeed, relatively small). Well whatever… Peter was a man with visions and without him, Russia would not be Russia today. 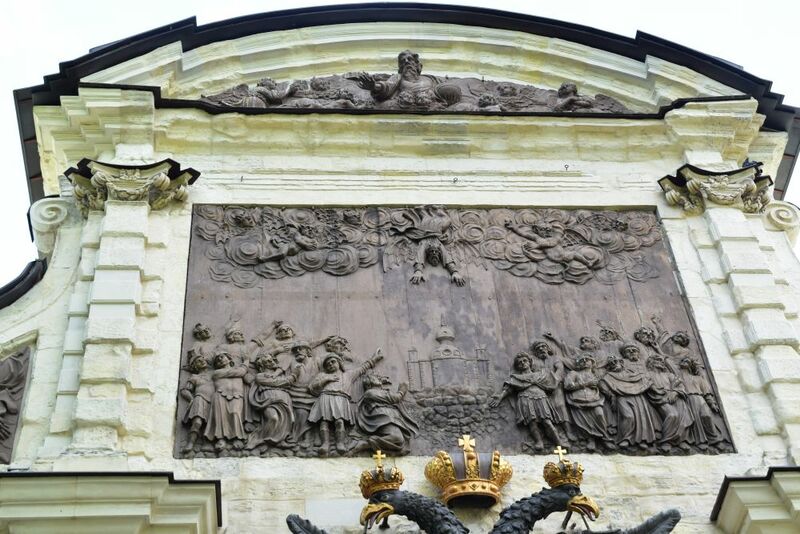 At the entrance gate, a wood carved panel praises his victory over the Swedes that provided Russia with access to the Gulf of Finland. It links Peter’s success with the victory of Petrus over Simon. My year-long Russian teacher, Anna, had grown up in Saint Petersburg, when it was still called Leningrad. That is why I also have links with the city. The first link is related with the mosque located near the Fortress of Saint Peter and Paul. 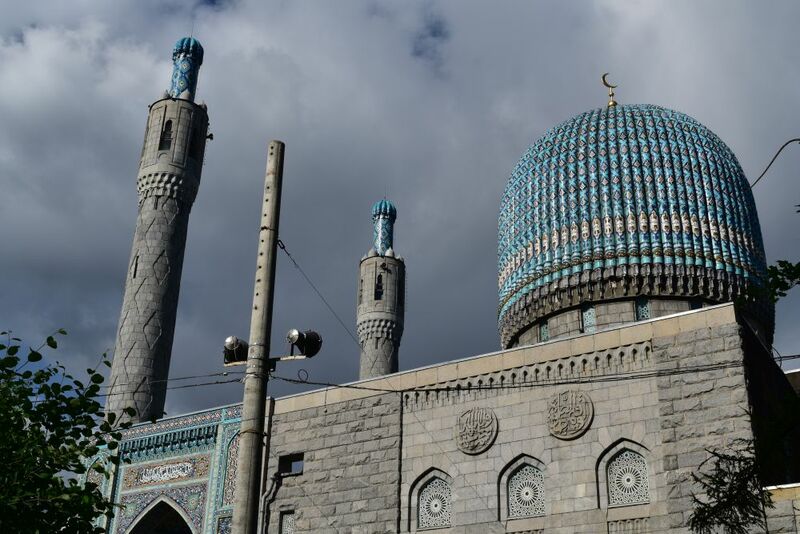 It has been built in the beginning of the 20th century – to resemble the mosque of Samarkand. 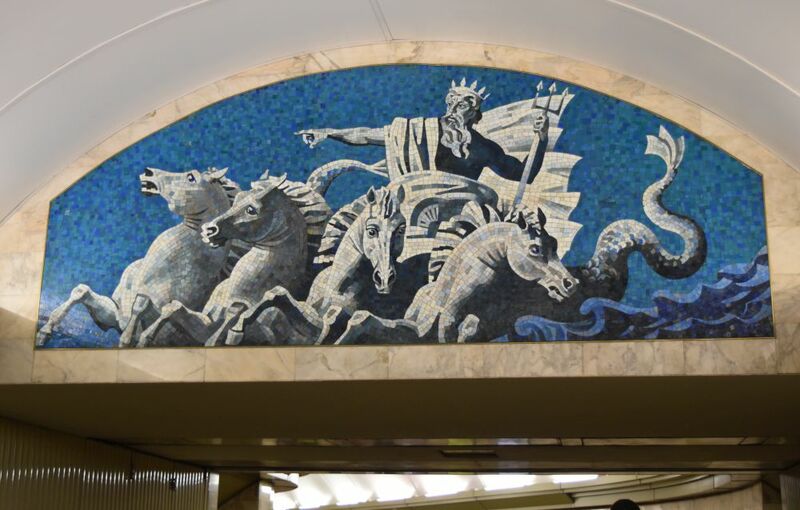 Anna’s grandfather, Vaulin, had made the blue tiles. 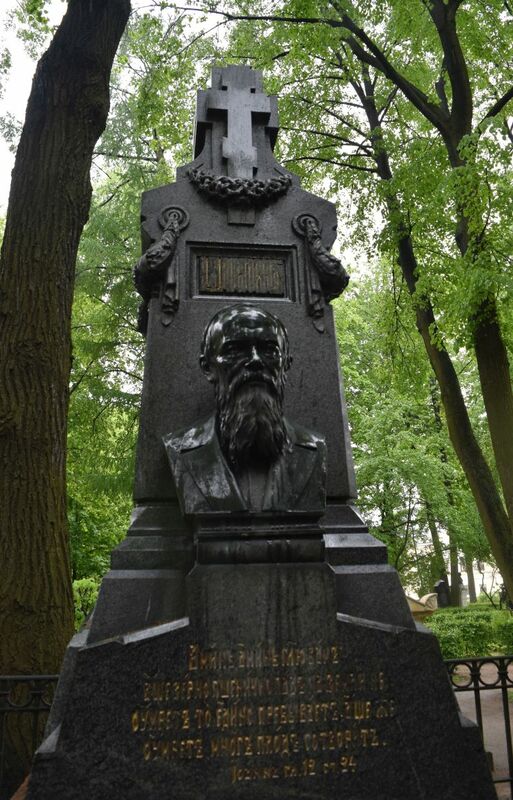 My second link is a little farther north on Kameny Ostrowsky Prospect where Saint Petersburg set up a park for Anna’s cousin Andrej Petrow, a well-known composer in Russia. 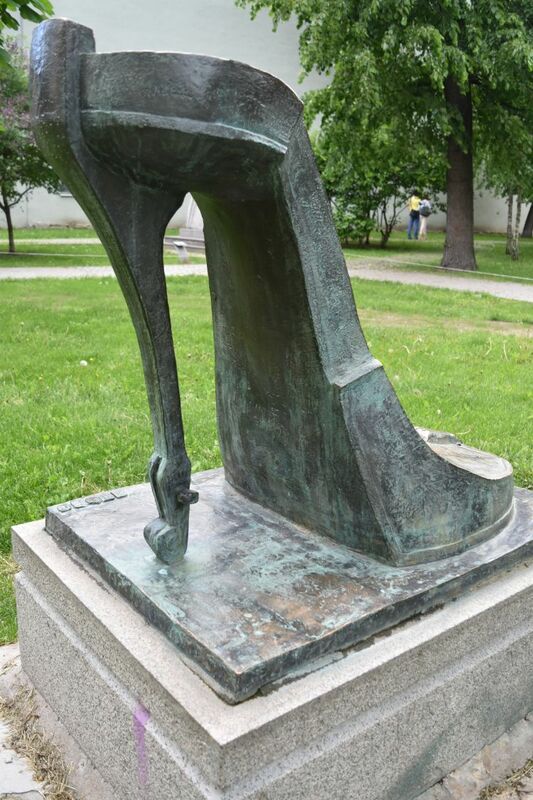 The park is decorated with humoresque musical instruments such as this violin on high heals. I wish you were still with me – here in your home town, Anna. We spent four weeks in Saint Petersburg. 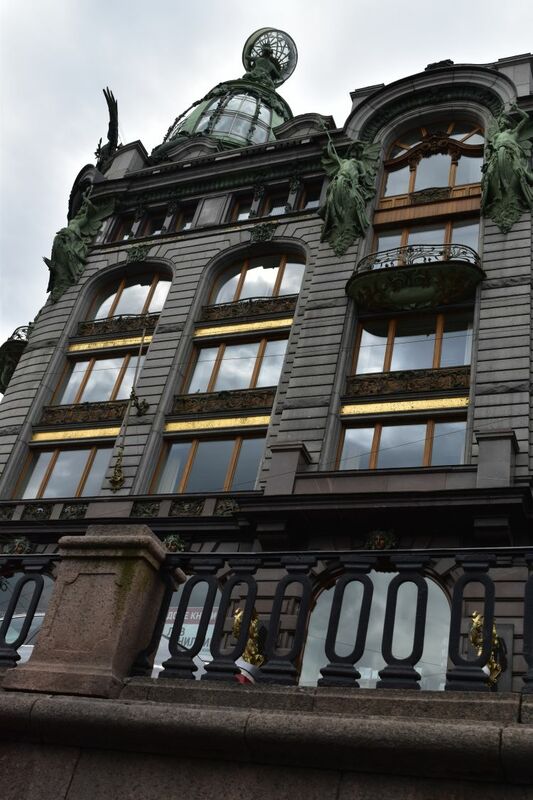 We visited the Ermitage, the Russian museum (both several times) and the new Fabergé museum. We explored palaces (such as the palace of Jussupow or the Stroganoff palace). 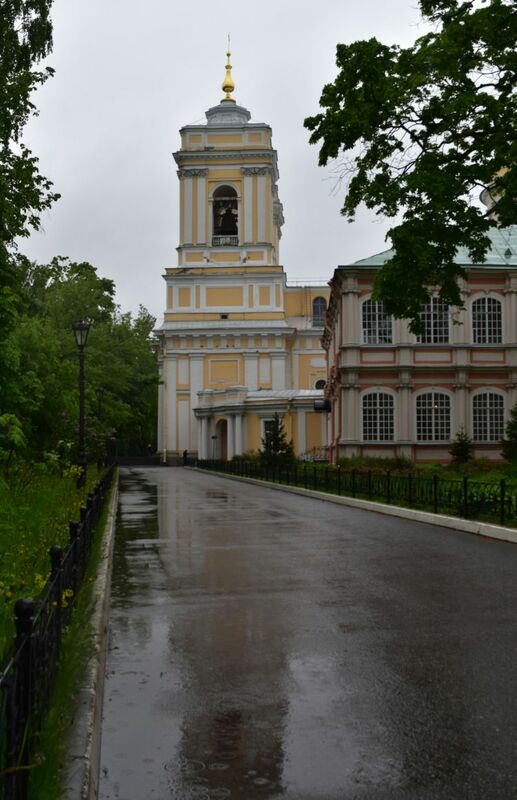 We saw cathedrals and churches such as Smolny and Saint Nicolas Naval. Twice we took a boat on the channels of the city. Twice we went to the Alexandrinsky Theatre where a friend of ours is working as an actor. 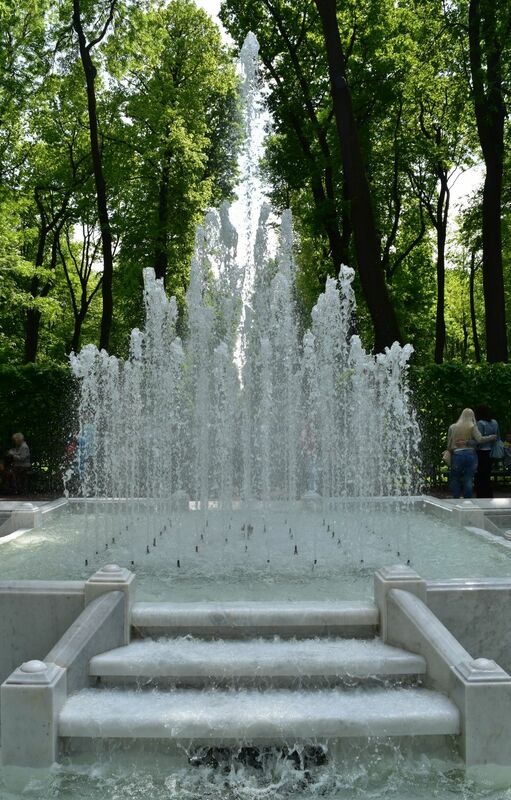 And then we also enjoyed the shopping experience and on sunny days, we relaxed in one of the many parks of Saint Petersburg. 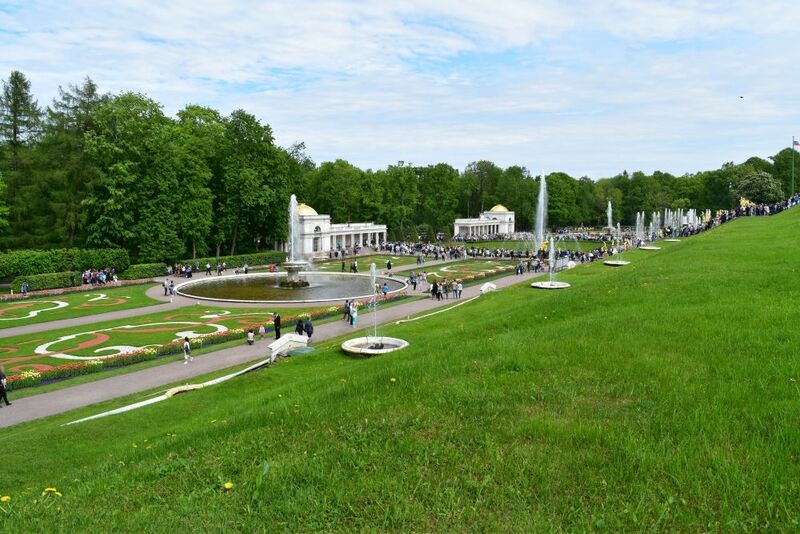 Attractions around Saint Petersburg that we saw are Peterhof, Puschkin or Zarskoe Selo, Novgorod and Karelia. 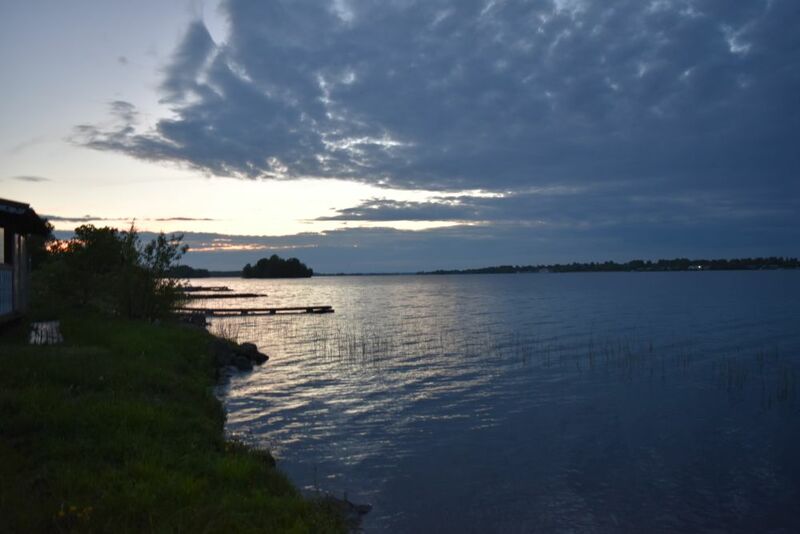 In Karelia we enjoyed an afternoon in Repino and a day in the datscha of a friend. 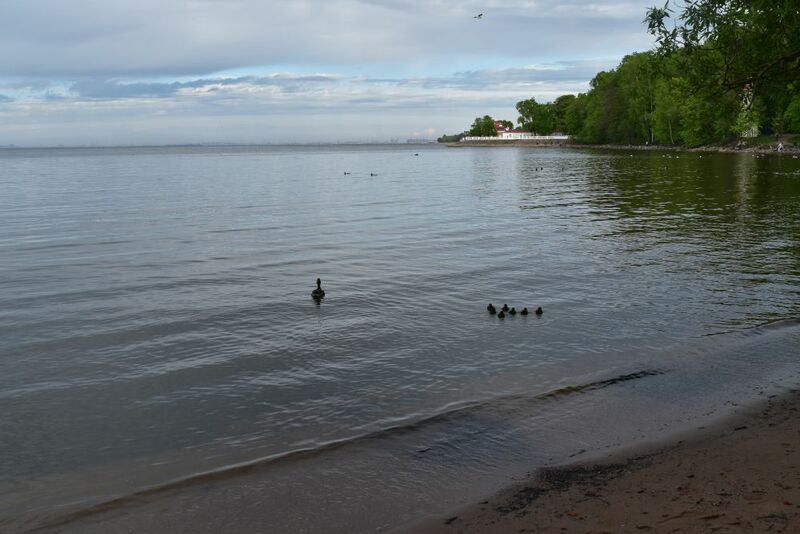 And we made a three days excursion to see Kizhi and the lake Onega. 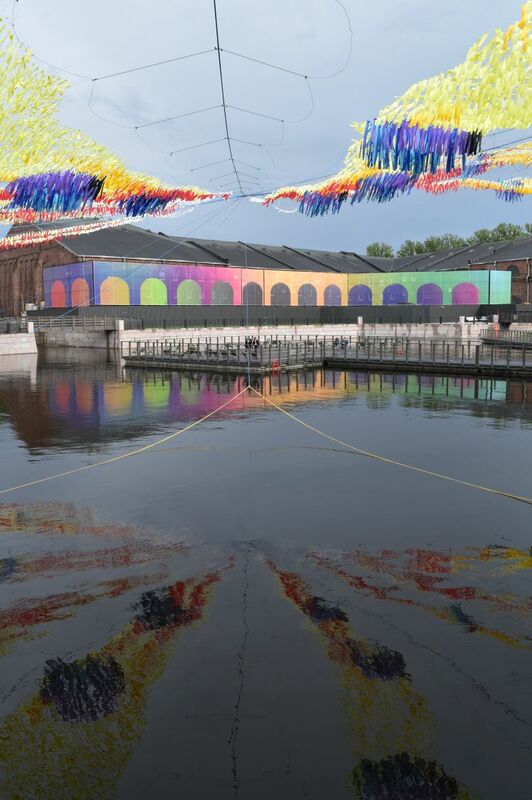 Four weeks do not suffice to see it all… yes, Saint Petersburg is worth a visit! I think of going back to Saint Petersburg. Our main literature sources are: Christine Hamel, “Russland”, Dumont 2011; Marcus X. Schmid, “St. Petersburg”, Michael Müller Verlag 2017; “Russia”, Dorling Kindersley 2016; Lonely Planets for Russia and Saint Petersburg; Vitaly Kulescha, “St. Petersburg Wishes Guidebook”, Piter 2013.